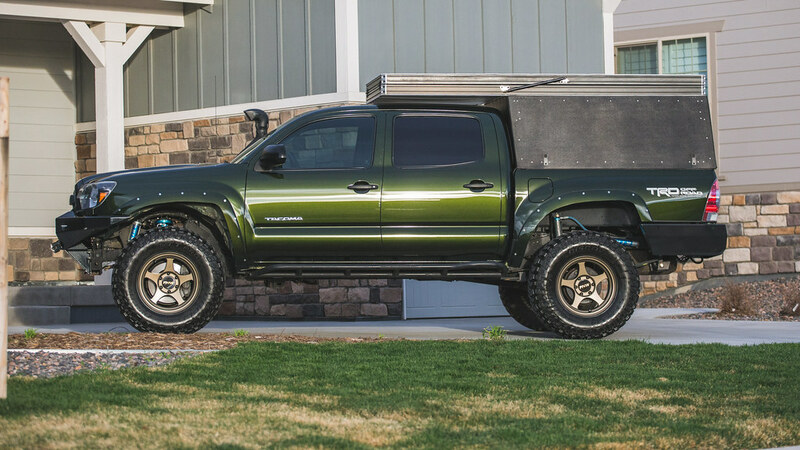 Quick Links: Containers for under sleeping platform Tonneau cover regret Parallel parking and washing shell Question on Yakima Rack system on ARE shell Recommendations: Tonneau Cover Hard, folding or rollup tonneau cover that allows you to still use the bed rails? 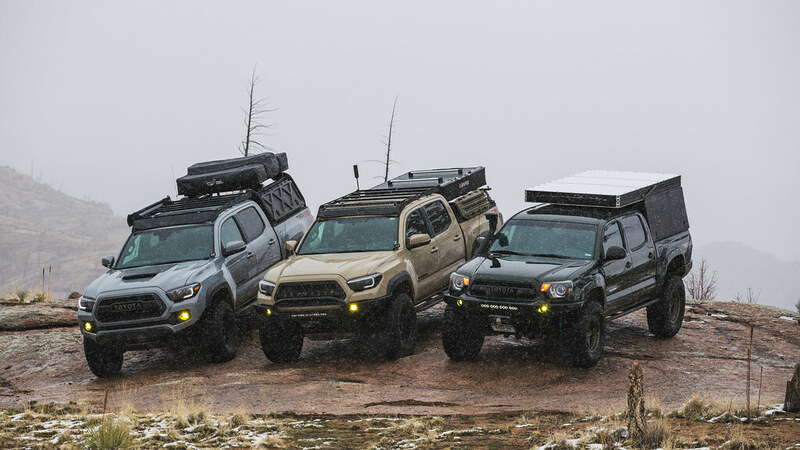 Discussion in 'Tonneau Covers, Caps and Shells' started by Ripcord, Apr 15, 2019 at 6:45 AM. *Credit where it’s due, the following is nearly a straight copy of the “Go Fast Camper” design. However, I am NOT selling anything, only sharing my experience. I asked for their permission before posting this thread. *Also, I am NOT saying that GFC is overpriced or that what I have done is an easy half price alternative. In fact, after doing this I am amazed their price is as low as it is when you consider their high end materials and pricey custom parts as well as the overhead costs of a shop and the extensive labour hours involved. I have great respect for them and their product. I have no doubt you would get your money’s worth. In 2018 I camped a total of 42 nights, and for 2019 I want to surpass 50 nights and get to a point where I can occasionally work remote as well. 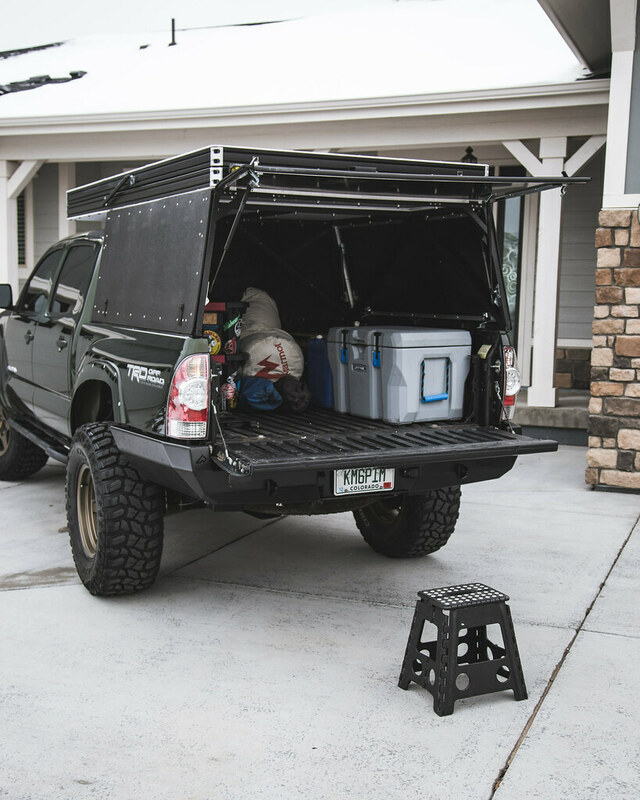 As great as my traditional Roof Top Tent has been, I was looking to make my camp faster and more livable. 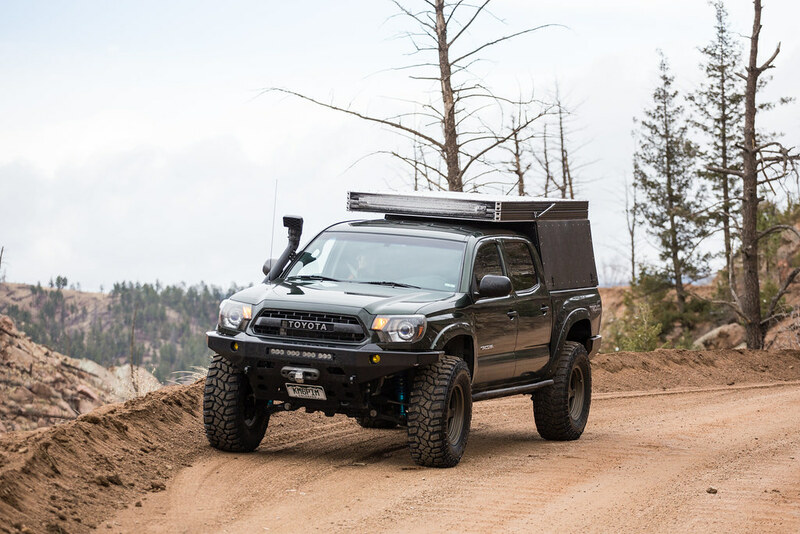 Wedge style campers seem to be the perfect balance between improving comfort and not degrading the truck’s capability. With their prices and lead times ($6-7k+ and as much as a year in some cases) being deal killers for me, I decided to make my own. How hard could it be? 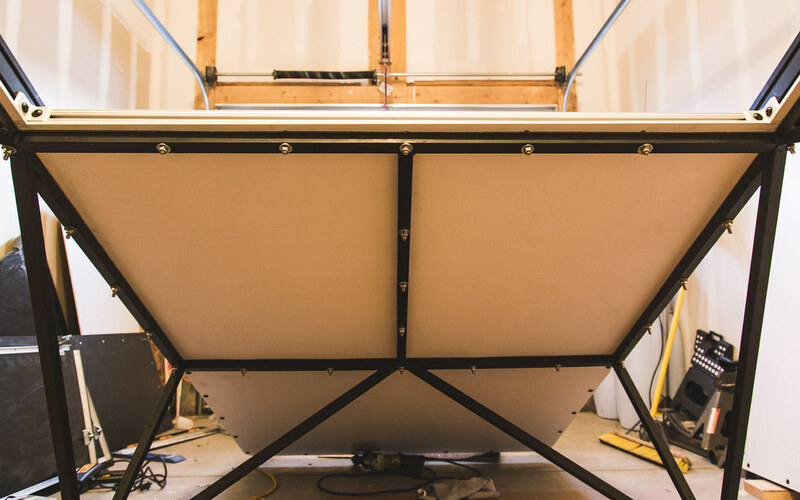 I originally planned to make an aluminium fabricated camper, similar to Vagabond or AT, but the more I looked at the GFC I realized it would be possible to replicate with minimal fabrication work and basic tools. 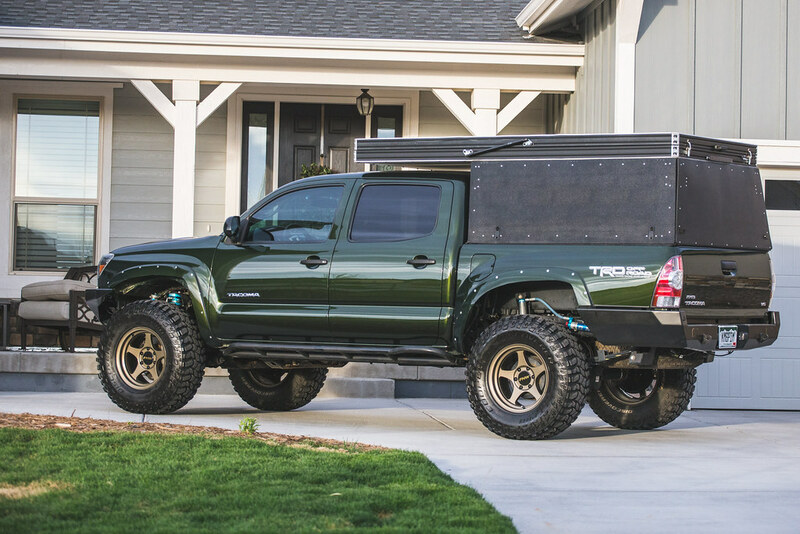 GFC has a lot of custom parts made for their campers. 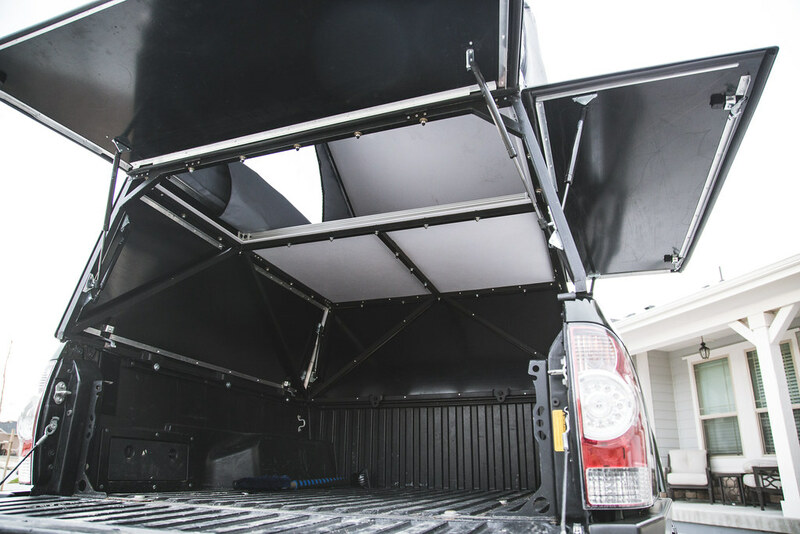 By finding more standard replacements for them, you can closely replicate the camper design and keep costs down. 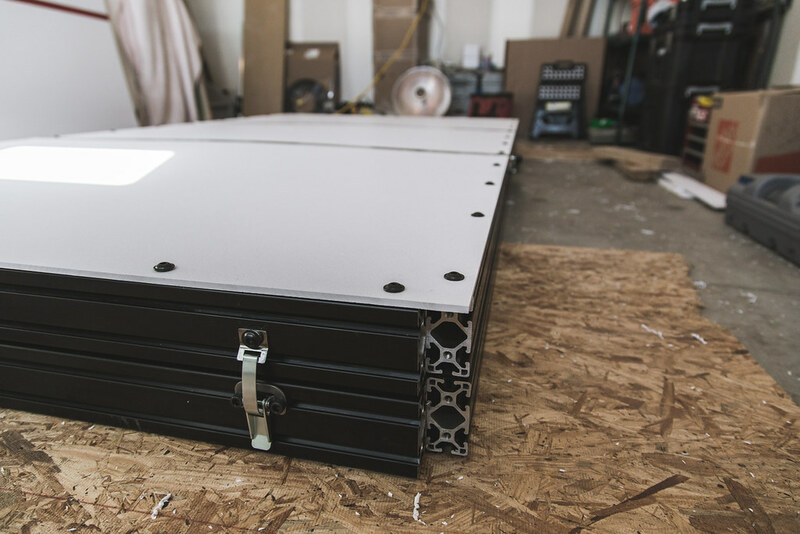 The main enabler for this project is the 8020 slotted aluminum extrusions, which act as a great building block for the frame of the wedge part. Less complicated Latch and Hinge for the wedge part (read: Faster and Cheaper). More room for blankets/pillows/tent material in wedge part when closed, making it easier to close. I don’t like having to move bed sections around, so I will make the whole camper longer to enable a fixed opening and a fixed sleeping area. There will still be a removable panel to cover this opening. I spent just over $4k, after tax and shipping charges on everything it was near $4.5k. But frankly, I paid way too much to have the tent material made. 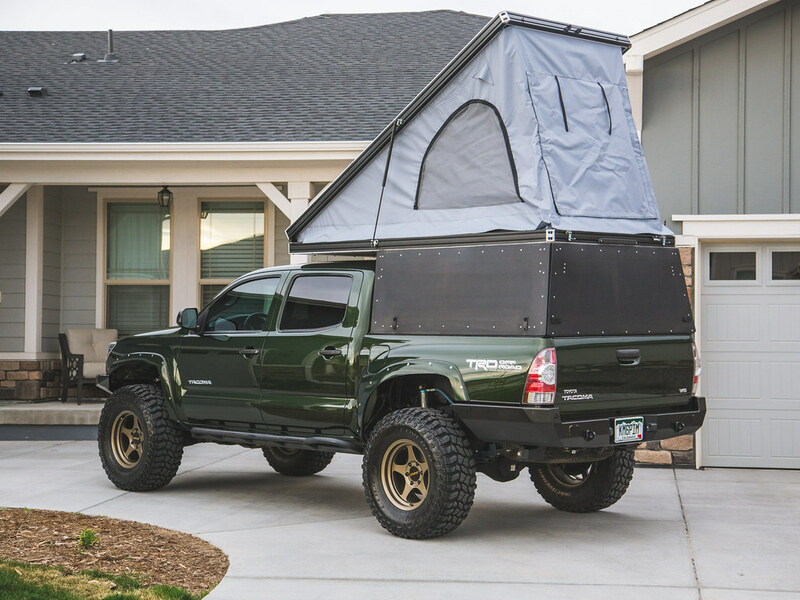 You could lower your total cost by around $1k if you did the fabric work yourself and even more by going cheaper on some of the other camper materials like the plastics. 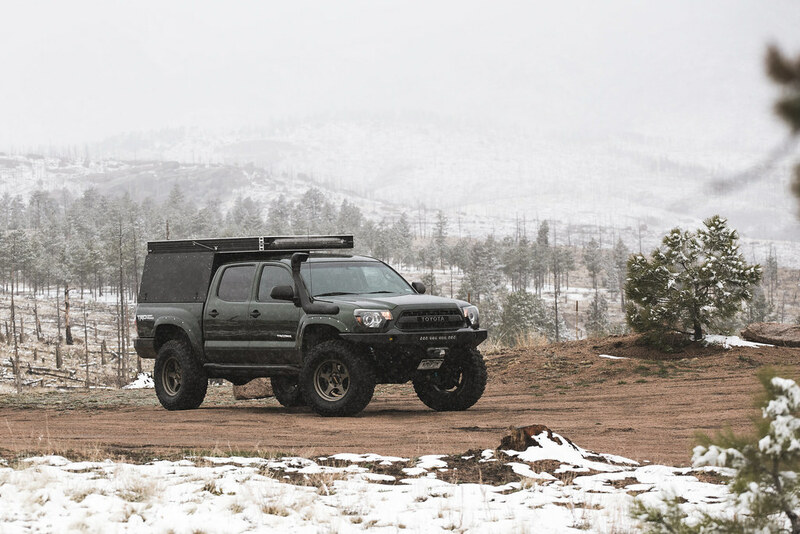 Realistically you could build this for $3k, if you do ALL the work yourself. My complete list of part numbers and prices can be found here: Spreadsheet on my Google Drive. This camper was a LOT of work, do not underestimate that fact. 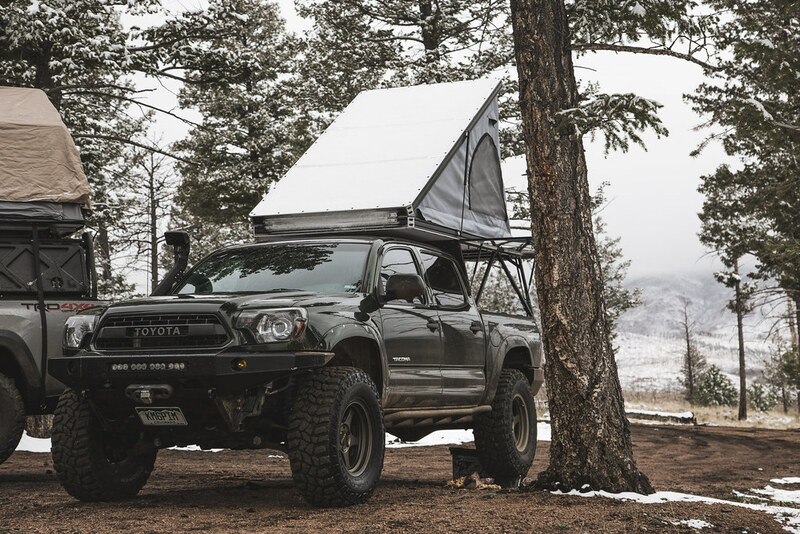 From ordering parts to a complete camper took every weekend for 3 months. And I spent 3 months on the design before ordering parts. For many people, the price of a GFC will be worth it to avoid this amount of effort. Here is the completed product. And my initial 3D model. 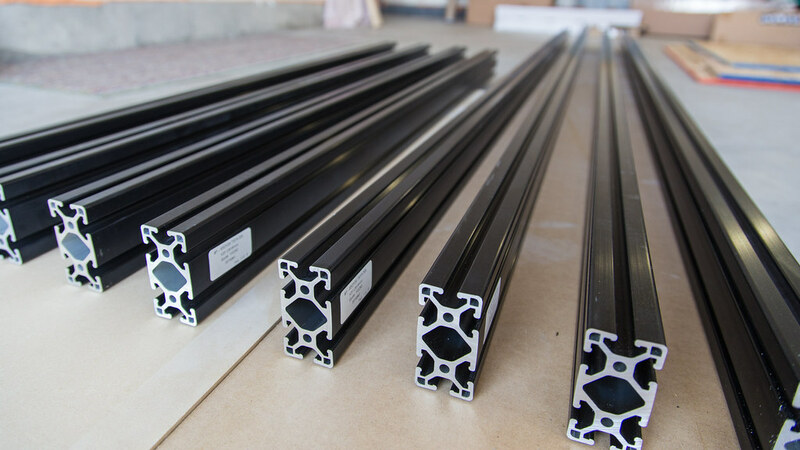 As I mentioned above, the frame of the wedge will be made of 1.5" x 3" 8020 aluminium extrusions. 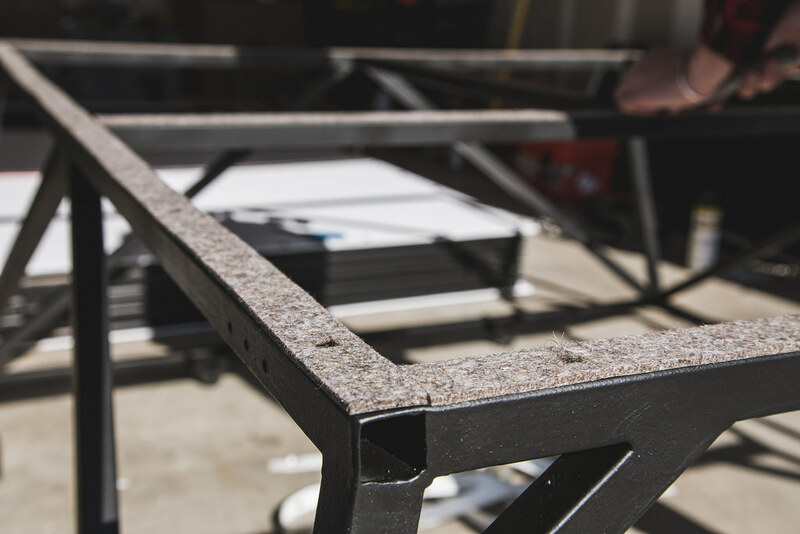 You all know them as the material RockyMtnRacks and Prinsu use for their crossbars, but they are more commonly used to make frames for enclosures in industrial settings and are also used to make some durable storage solutions. 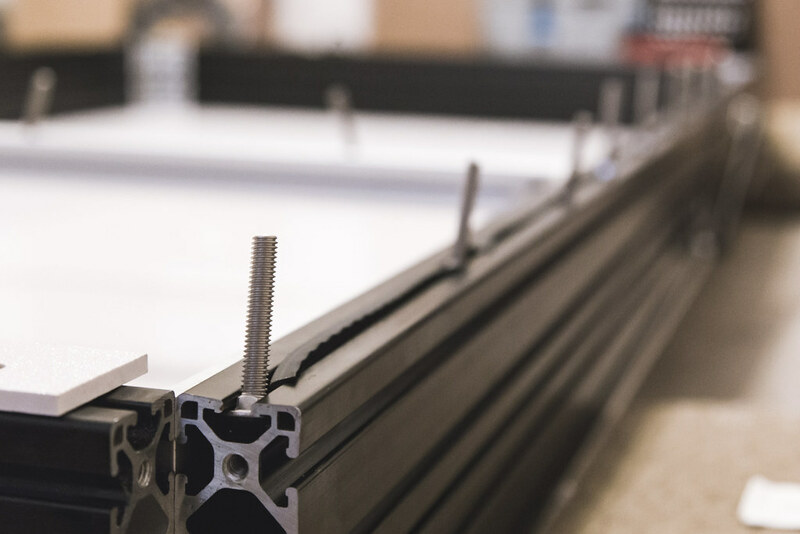 First step is to cut the Extrusions to length and tap the ends with 5/16”-18. The extruded holes in the ends are already the perfect size for this tap. 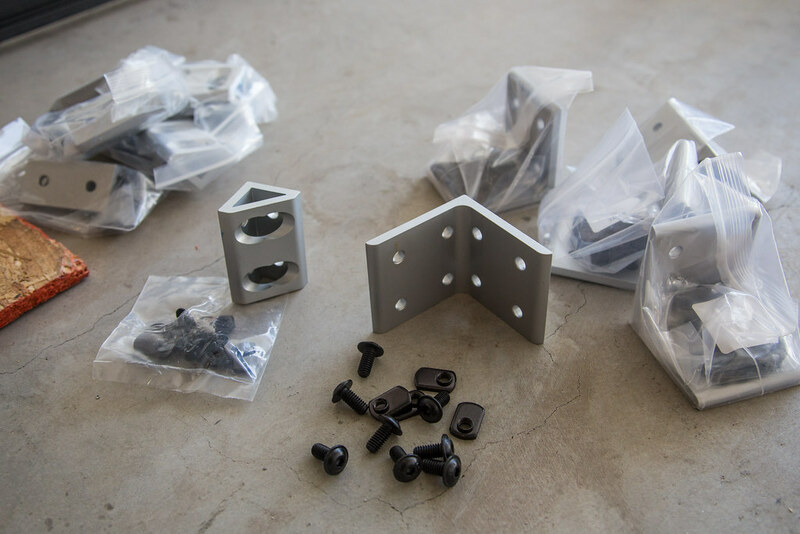 There is a whole suite of accessories for these; from hinges, latches, seals and device mounts to structural parts like corner pieces and flanges. The entire setup is very modular and easy. 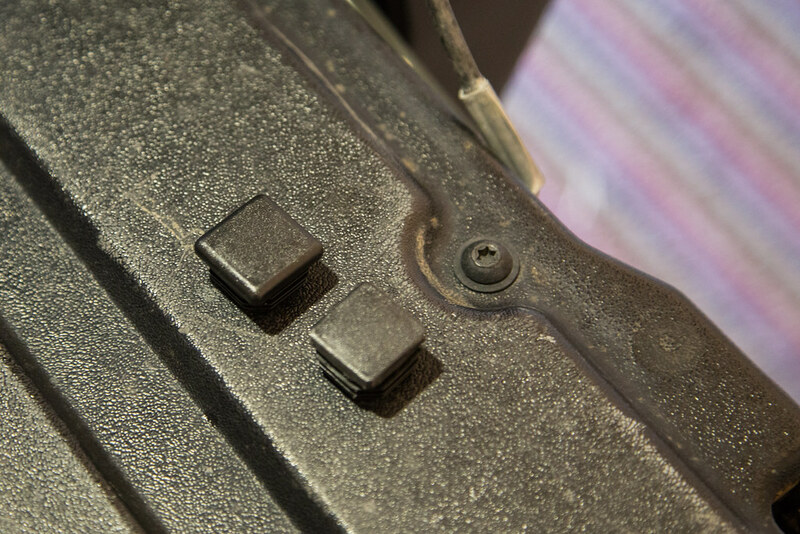 Everything attaches using slot nuts like these. Here are the corner pieces I am using. 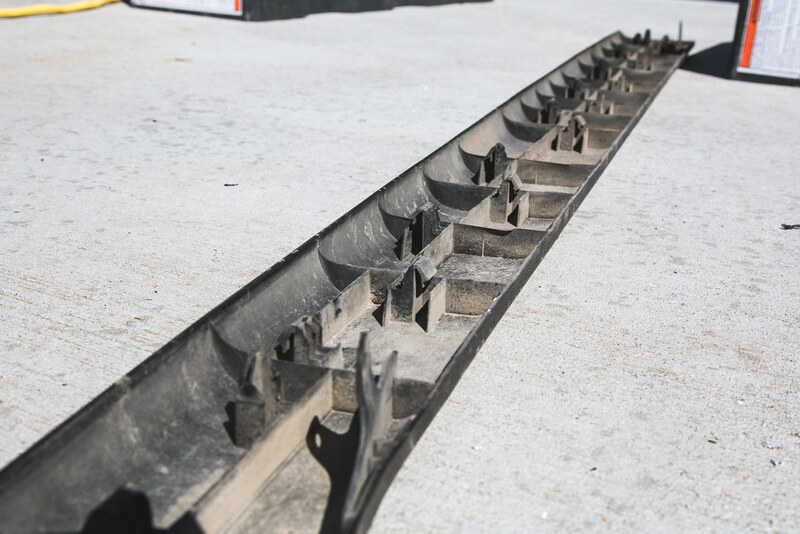 The interior corner pieces are the main source of rigidity along with the plastic roof/floor panels, the exterior corner pieces are mostly for appearance. 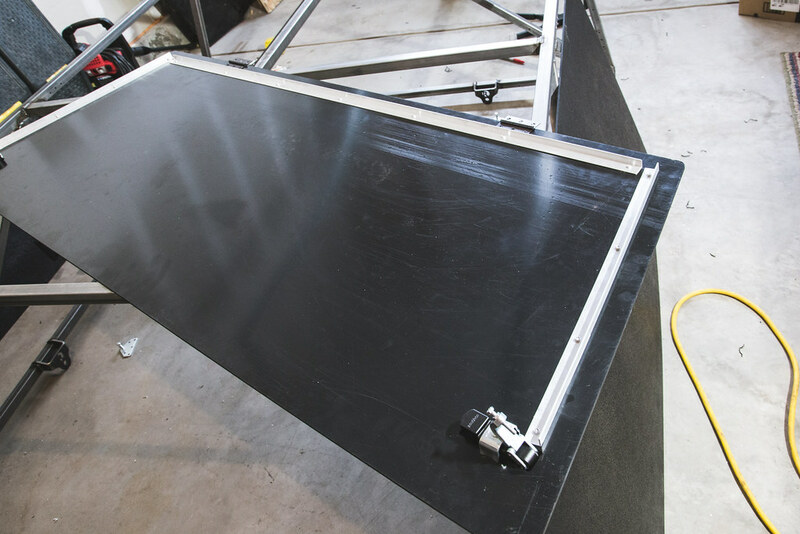 The floor will also have extra rigidity from being fastened to the space frame. Frame halves fastened! See? I told you it was easy. The total inside dimensions are 50in x 100in. The sleeping area will be 50in x 75in (close to a Full mattress at 54in x 75in). The remainder is for the entry/exit opening, which as I mentioned can also be covered and used to extend the sleeping area. 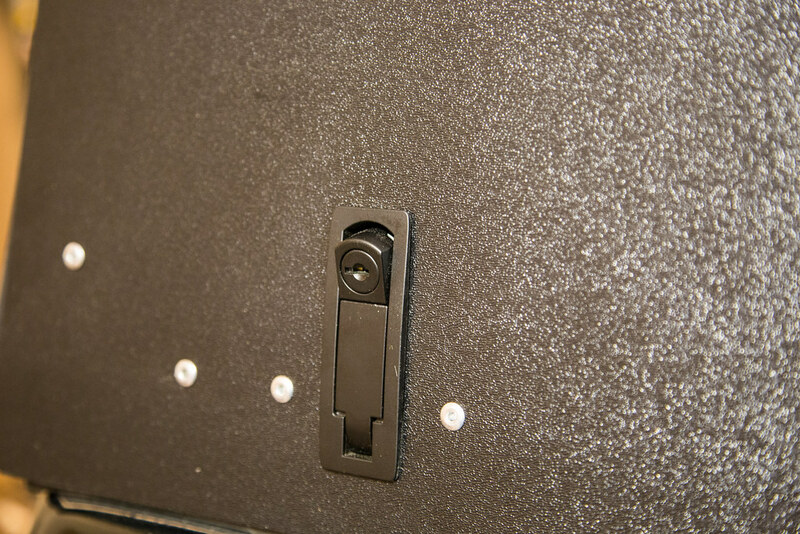 Some nice black anodized aluminium hinges and the exterior handle. Fitting the gas struts. 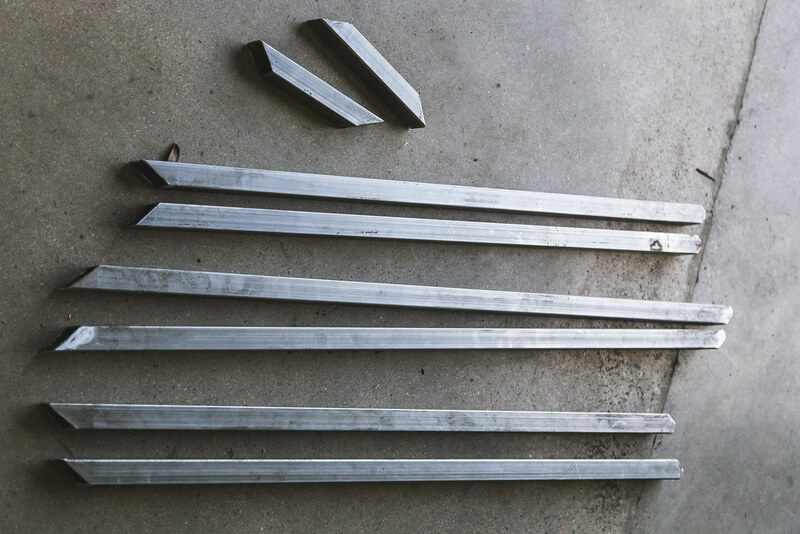 The struts for the wedge are 100 lbs 36” models, got them from siraweb. One strut per side. The mounts are also from siraweb. 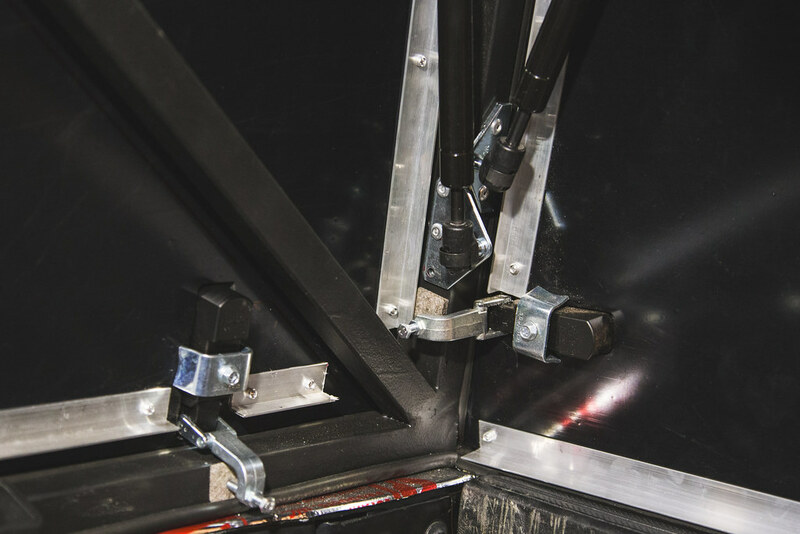 The mounting position is defined by the desired open height of the wedge and the struts being near fully compressed when closed. I used some of these bulbed seal strips to seal the wedge. 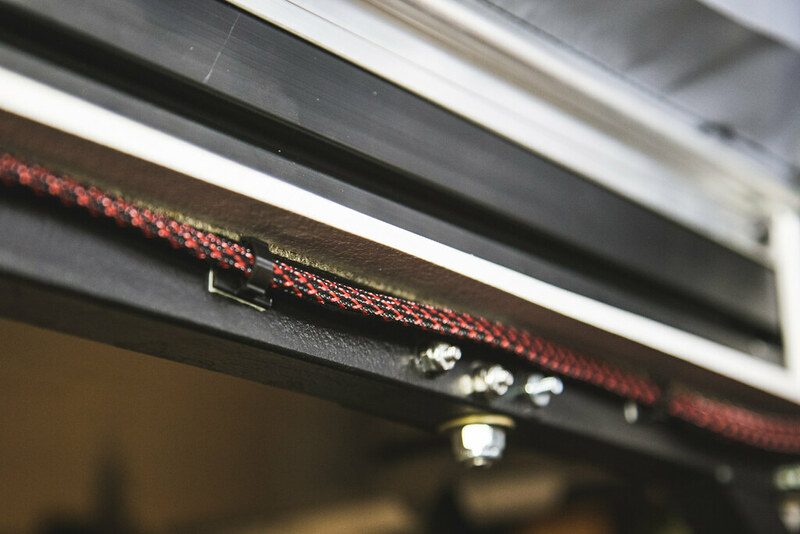 This seal is designed to sit in the extrusion slots as shown. 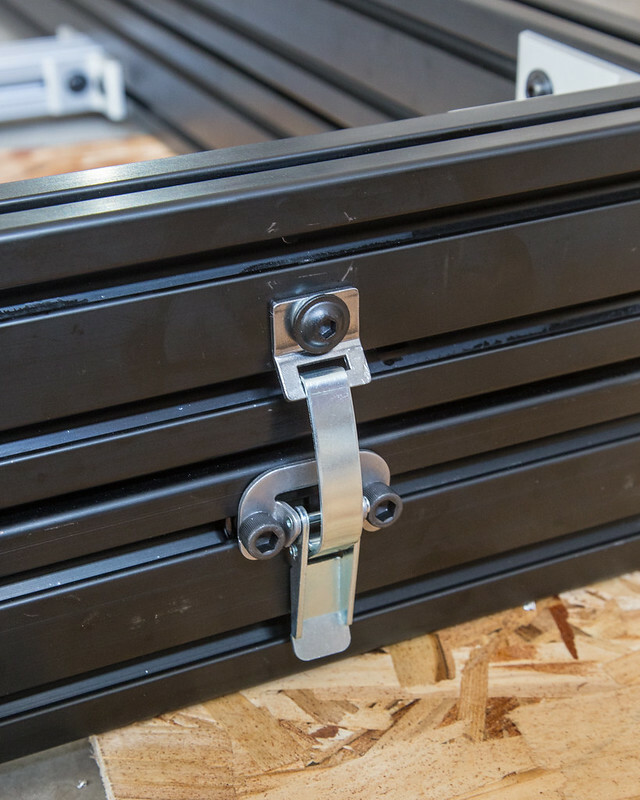 Draw latches and handle on. Wasn’t totally happy with this latch, but since it was the 3rd style I tried I was just wanting something that would work. 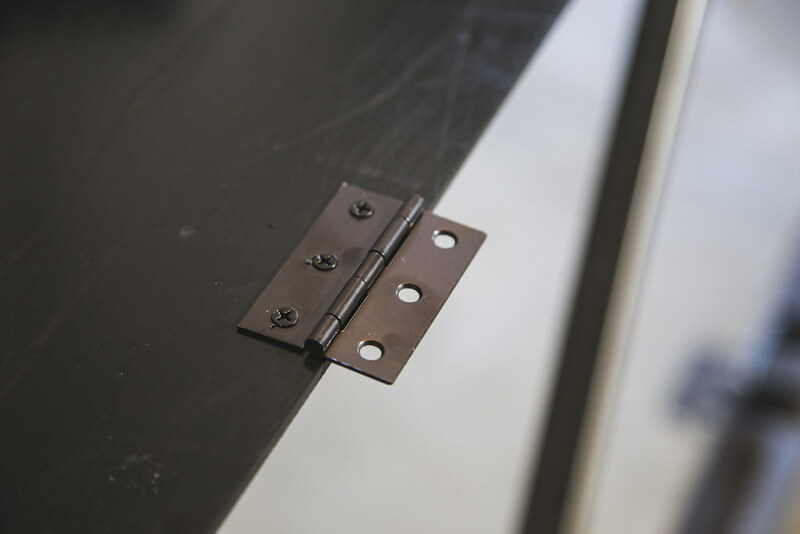 One potential issue of this type of latch (draw latch) is that they must line up fairly well in order to latch. 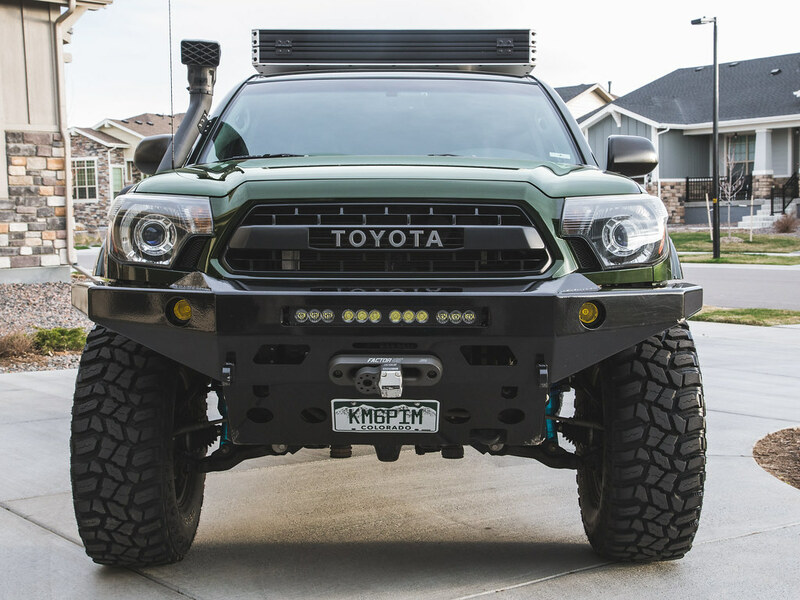 Lately I have seen a lot of GFC customers commenting how the top and bottom of their wedges sometimes do not line up due to frame twisting (the truck’s frame), although mostly just with people who have swing out bumpers in opened position. If I have an issue lining up these latches in the future I may consider an alternative latch style. 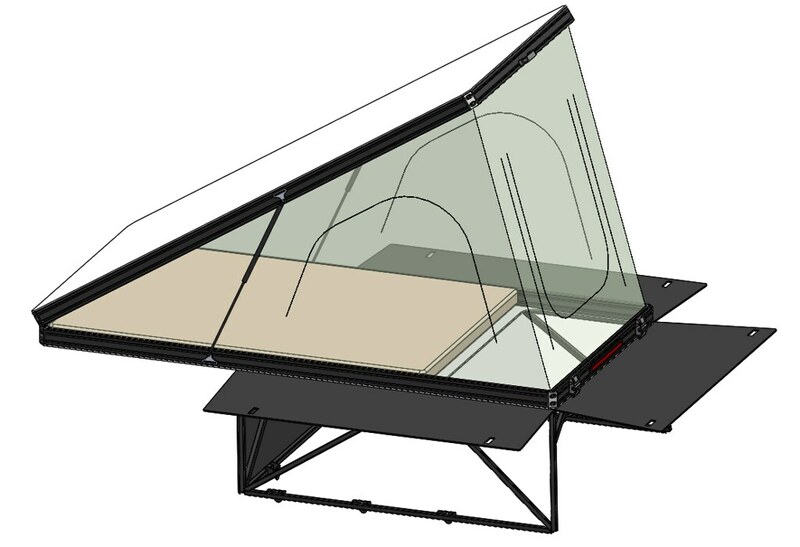 The Roof and floor are made from ¼” ABS plastic. I got the sheets from a plastics supply shop in Denver called Plasticare. I talked with them about the project and they recommended it based on my usage requirements. Went with white for the solar heat reflection benefits. 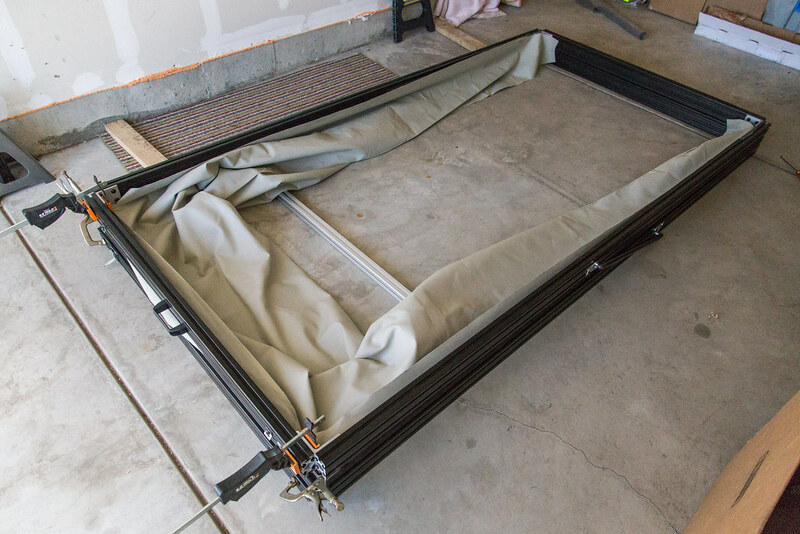 Sheets were not available in the full size of the 103”x53” roof & floor (96”x48” max), so I had to get multiple smaller sheets and connect them with these trim rails and Lexel clear sealant. That ended up being a good thing though because those rails add some rigidity to the whole roof. Curing time was 7 days, so I had them strapped together while the sealant cured. 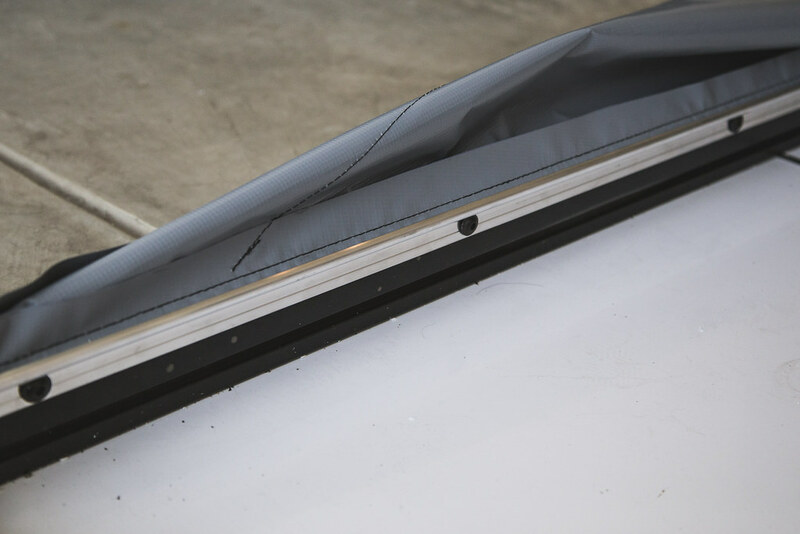 *one thing to note on plastic sheets, it can expand from temperature exposure. I will have to keep an eye on these to make sure they don’t warp. 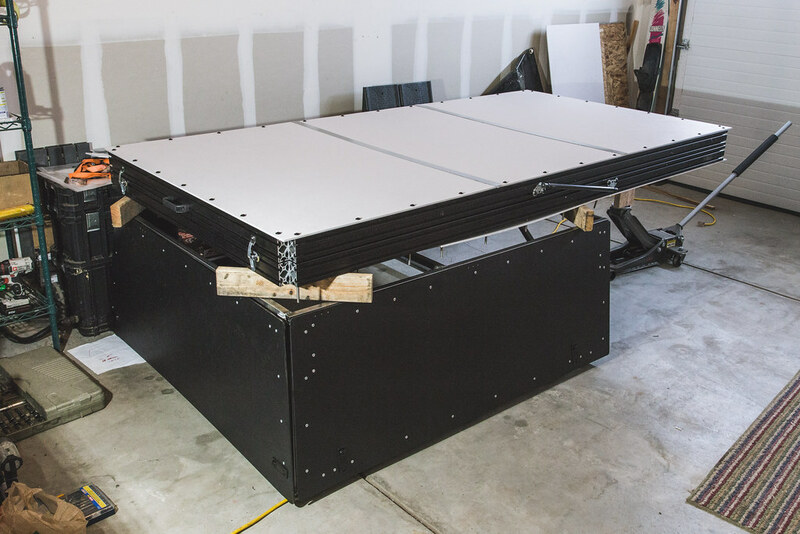 GFC uses a composite honeycomb sheet that has less of the expansion behavior and also a bit of insulation, but is more expensive. Along this whole interface, I used this weather seal. 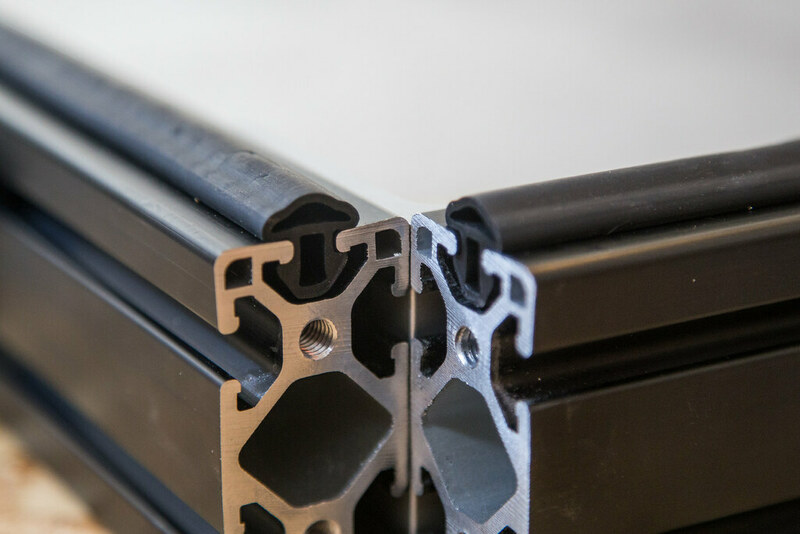 Similar to the bulbed seal above this one is designed to sit in the extrusion slots, but it differs in that it is meant as a fixed seal against a flat surface like these panels. 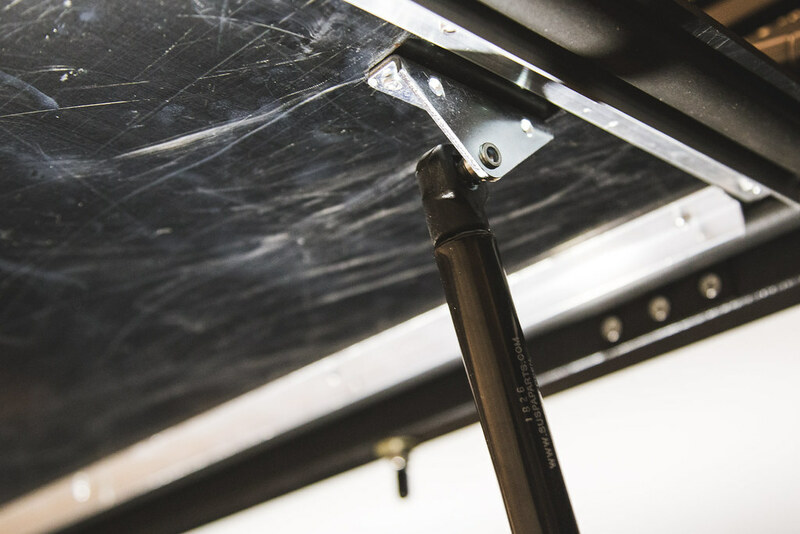 GFC’s custom extrusions have flanges on them that help with mounting the roof & floor inside the frame, so their camper is a bit different in this area. 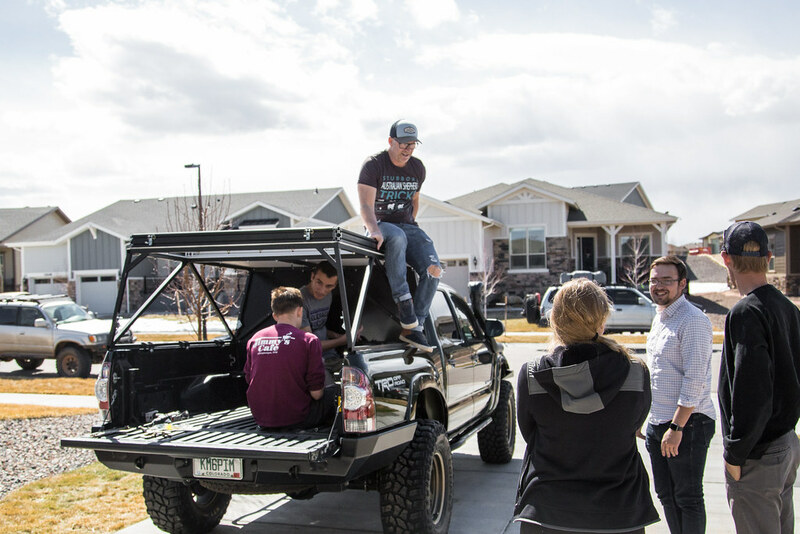 But, having the roof/floor mounted outside the frame gave me that little bit more real estate inside. Here is the floor with carriage bolts as mentioned above (wedge is flipped upside down in this picture). 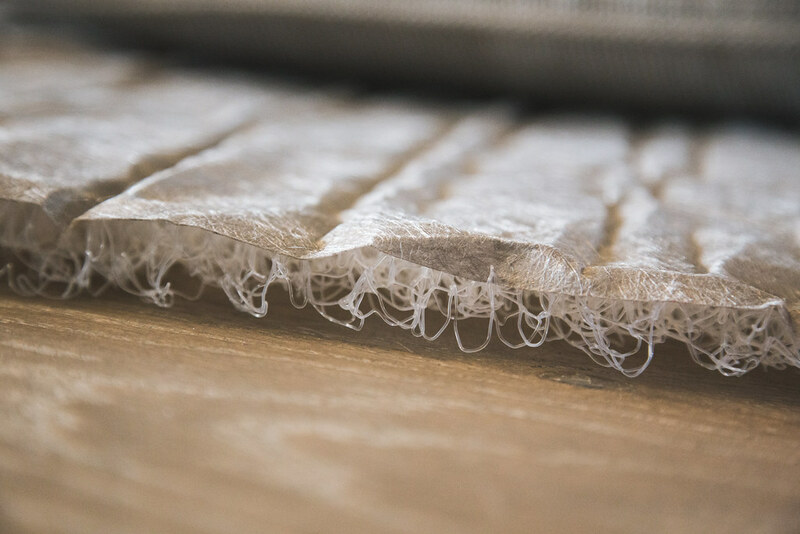 Moving on, for the anti-condensation mat I used a material called “Hypervent”. 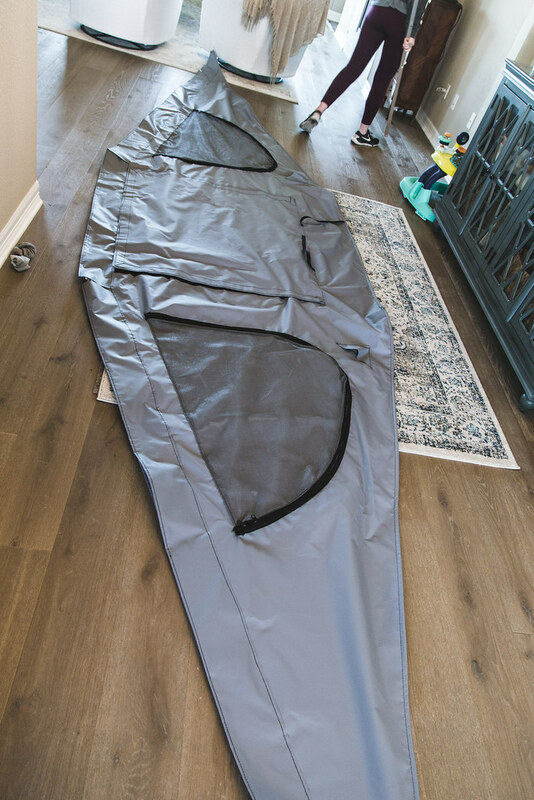 Was much cheaper than buying a mat from one of the RTT vendors and trimming it to size. These mats are necessary because without them the mattress warmed by your body can produce condensation underneath it which can lead to mold! This particular brand of mat is very commonly used in yachts and houseboats (lots of humid air), so I am pretty confident. 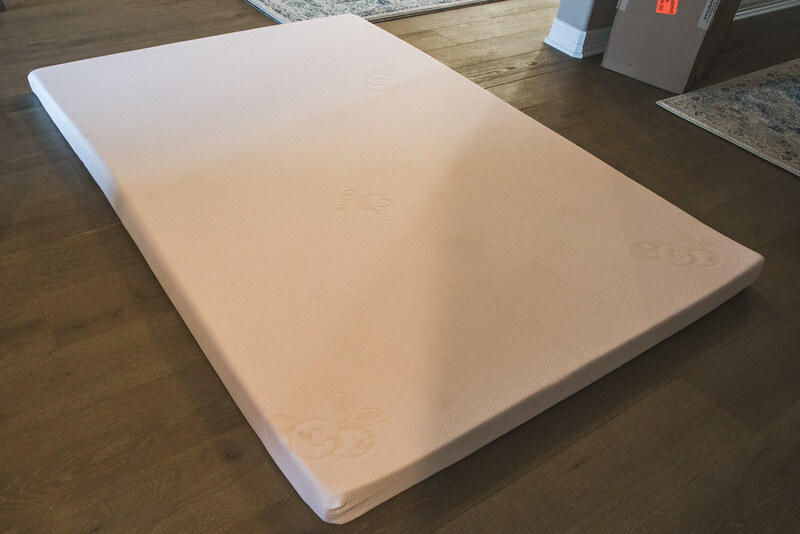 The mattress itself is a Full size 3” high density (5 lb/cubic foot) mattress topper from The Foam Factory online. It is too wide by 4 inches, so I trimmed a few inches off the side to get to 50”. 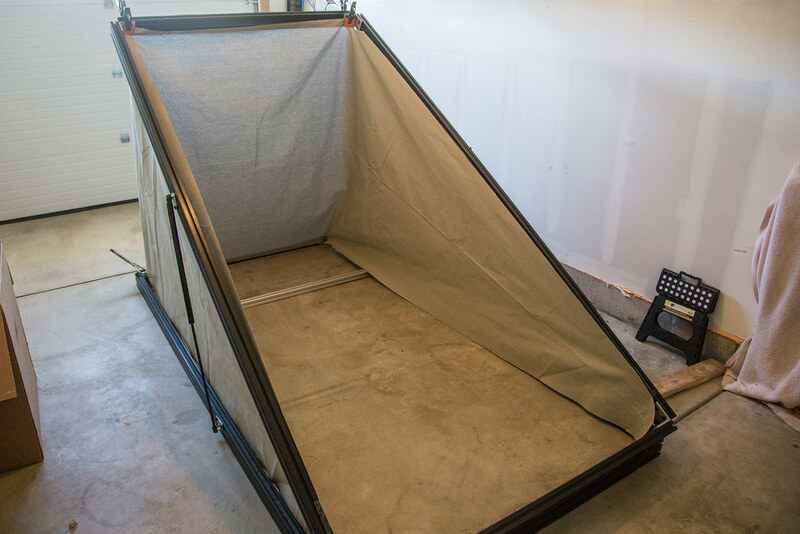 Yes, I thought about just making the tent 54” wide on the inside; but I wanted to be able to mount things like an awning on the outside without getting too wide. 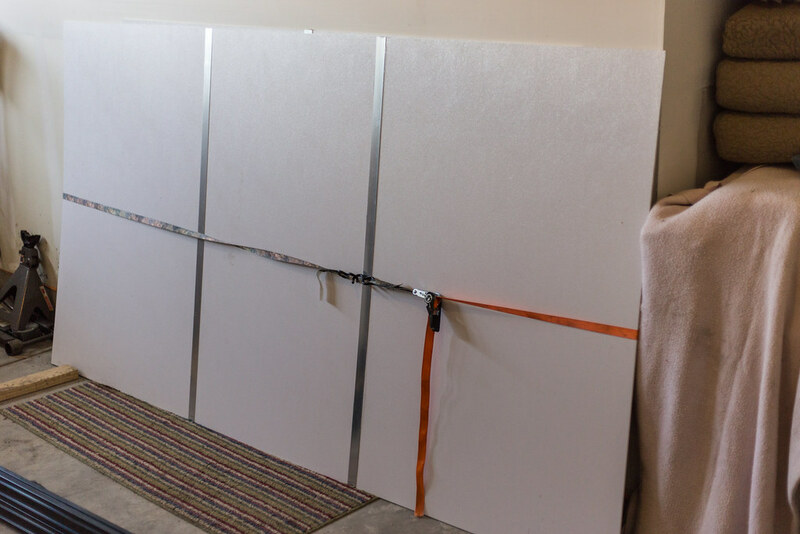 For the tent material part, I first made a template out of some cheap canvas from the fabric store (before the roof/floor was done). Another benefit to the extra space at the entry/exit section (marked by the silver crossbar here) is that it provides tons of room for the tent material when the tent is closed, making it really easy to close! 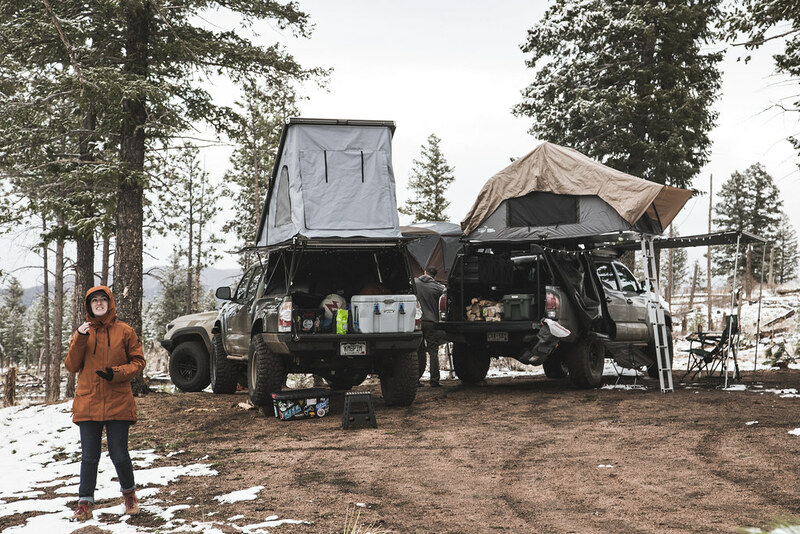 GFC’s can be difficult to close due to lack of space for the tent material. I talked to a local shop for a couple weeks to mature a design for the tent material. I was limited to 56 inches in tent height due to the 60” material. Ends up being around 32 degrees opened angle for those who are curious. The final product is made from 14oz Vinyl Coated Polyester. 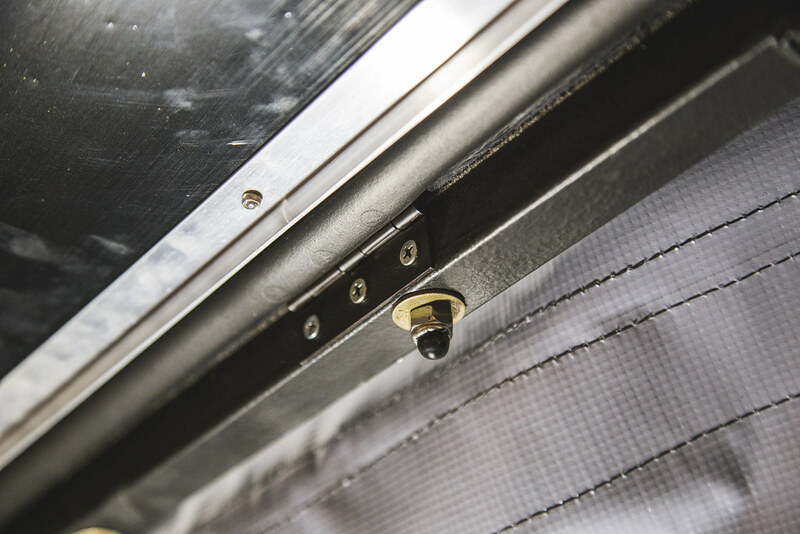 The edge of the tent material is fastened to the frame by this slotted bead feature known as keder rail, its same way that standard Roof Top Tents are done. 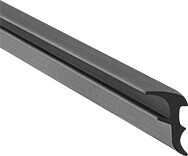 You just need to get these flanged slot extrusions to fasten to the base you want to attach the material to. GFC uses snap fasteners here instead. 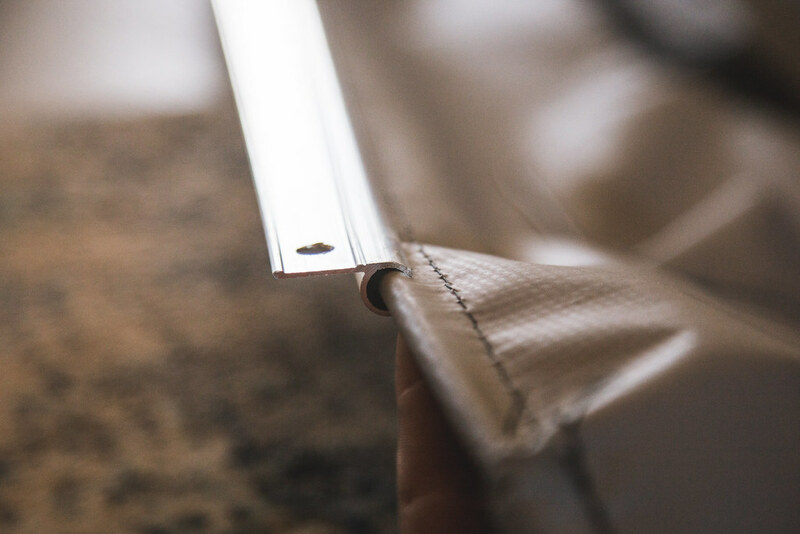 I decided on the keder rail because I thought it would pull the tent material more uniformly. Attached to the inside of the wedge. Wedge done! 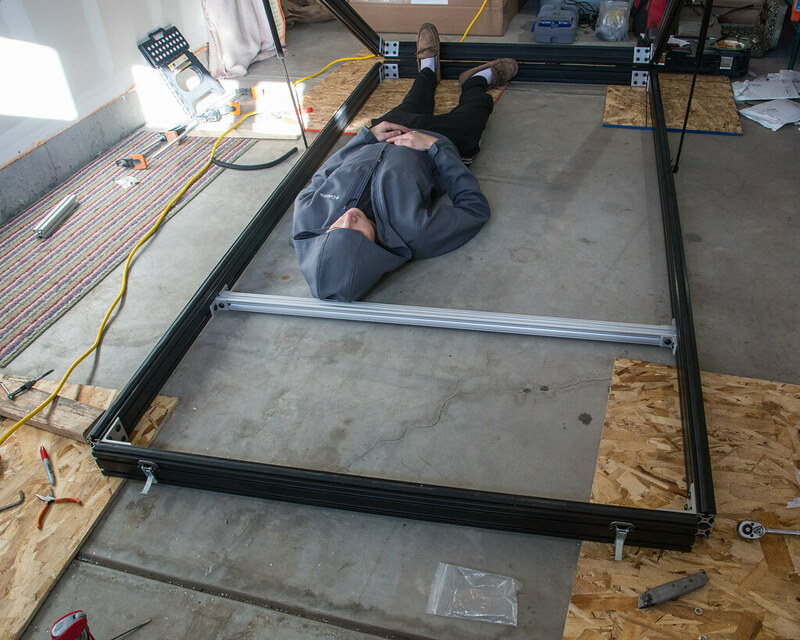 If I were just going to mount this to an SUV, I would pretty much be done now (though the floor would still need more support structure and no entry hole in it). 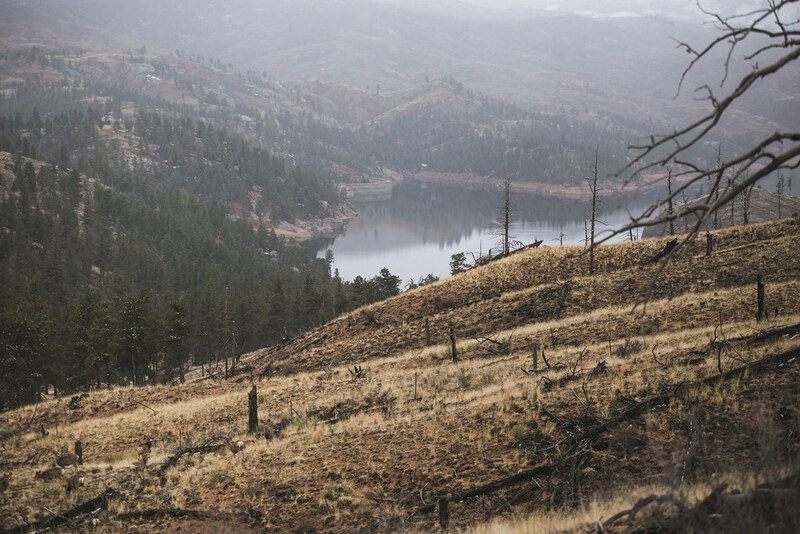 synaps3, DaveInDenver, ScenicCityOverland and 17 others like this. 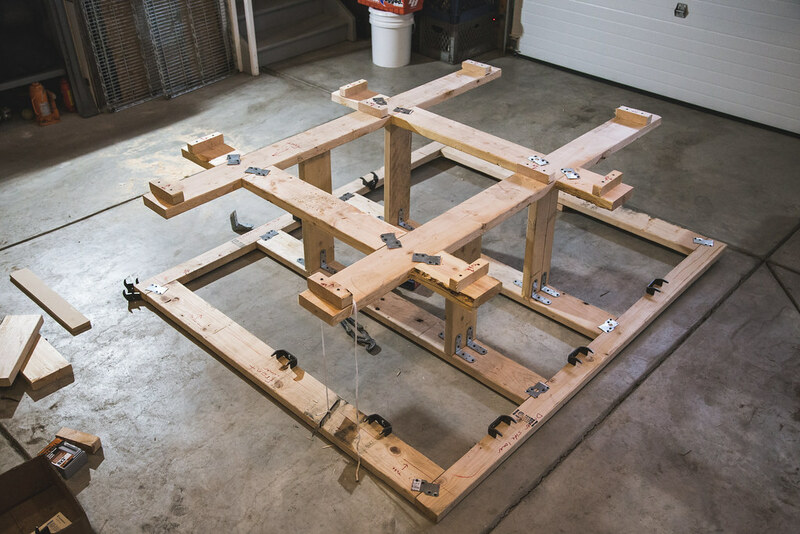 For the spaceframe, I first made this welding jig out of some spare scraps of wood. The fixture was needed because there are a lot of angles to keep under control, the sides tilt in and the front/back tilt forward. The only orthogonal parts are the horizontal sections at the top and bottom. For those in the Colorado front range, I still have this jig. PM me if you want to use it. I decided to go with square tubing because IMO it was easier to fixture, cope, attach seals to, drill through and latch onto compared to round tube. I made these bed rail mounts, laser cut and press brake bent at my work. 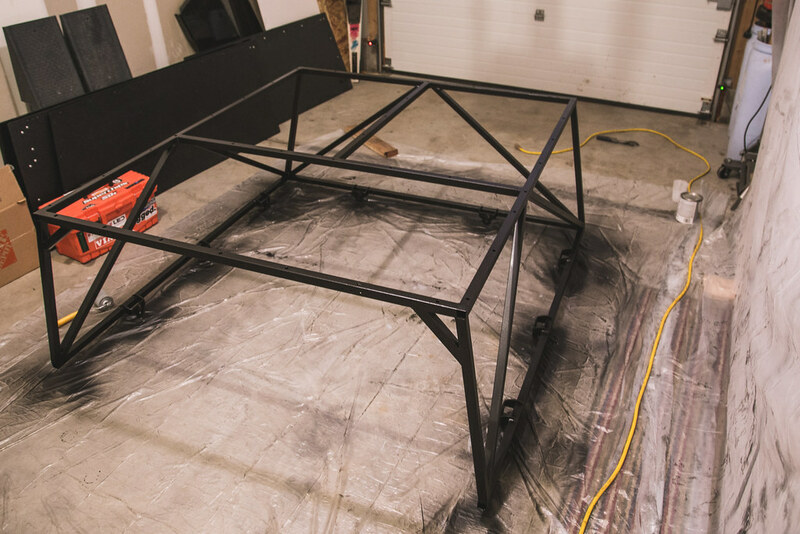 After getting all my holes drilled and grinding down the exterior welds, I painted the frame. Painted flat black outdoor metal paint with roller brushes, spray paint for the hard to reach areas. Got these 1” square tube end caps for the open ends and trimmed the sides so they would sit flush in the tube. Used sealant around the edges. 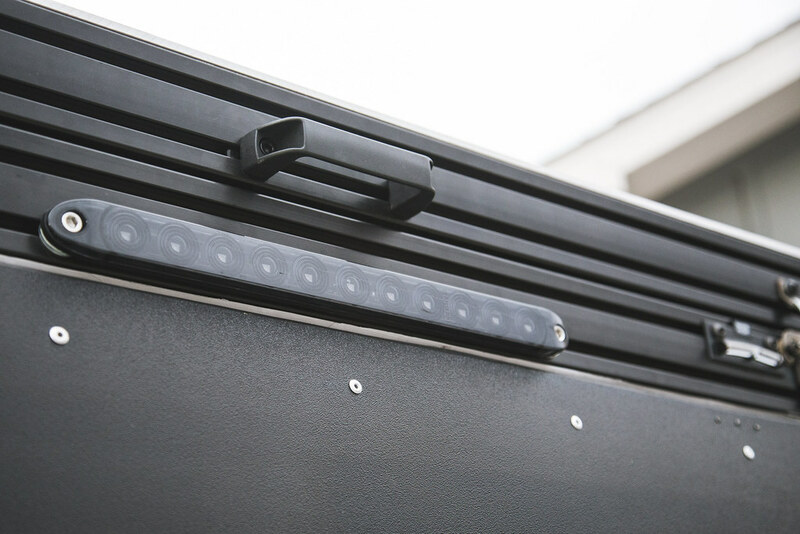 All the side panels are made from black 3/16” ABS plastic. These panels are textured on the outside, I figured that would show less scratches. My friends at Rocky Mountain Racks let me use their new router toy to cut them to shape and add the latch cutouts. GFC uses 8xxx series aluminum sheet for these, the plastic was a bit cheaper in the end but having the extra stiffness from the aluminum sheet would have been nice. Probably would do aluminum if I made another. Some basic home depot hinges. I specifically got hinges that would sit flush against the panel & frame and leave a gap in between that the bulbed seal could fit through. You ideally want to position one hinge close to each gas strut mount, then another in the middle of the panel, so 3 per panel. Gas Struts on. There was a lot of measuring to get the opened height where I wanted it and also getting the right amount of leverage on the door. 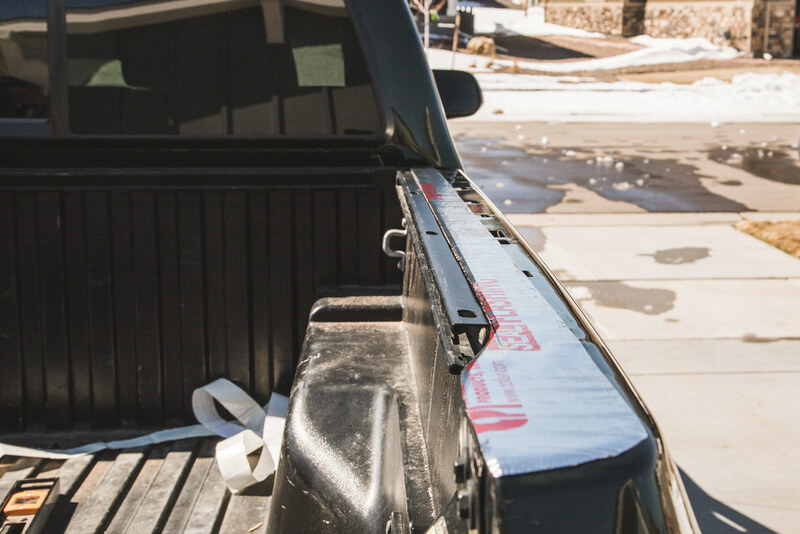 I set the opened height of the doors so they still angled down slightly and drain rainwater away from the truck. Now for the Southco Latches. 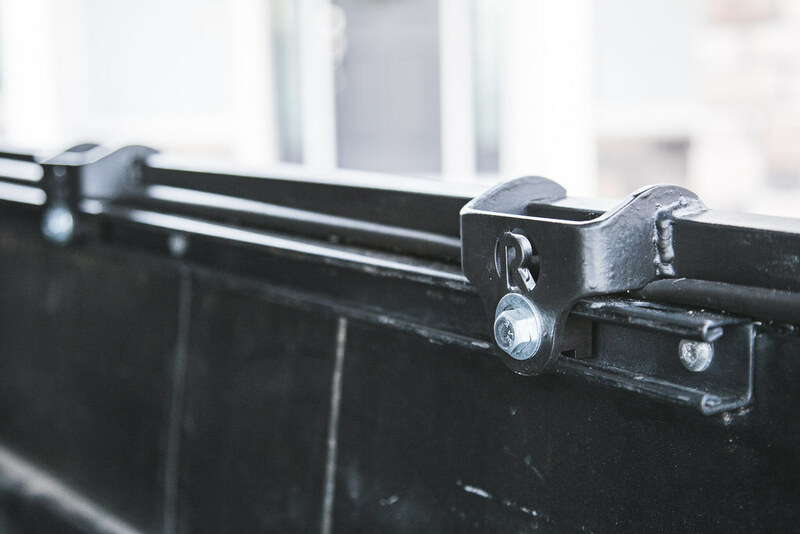 These are really neat low-profile latches and are the same ones that GFC uses, although a slightly different clamp length version for the 1” square spaceframe tubes I am using. 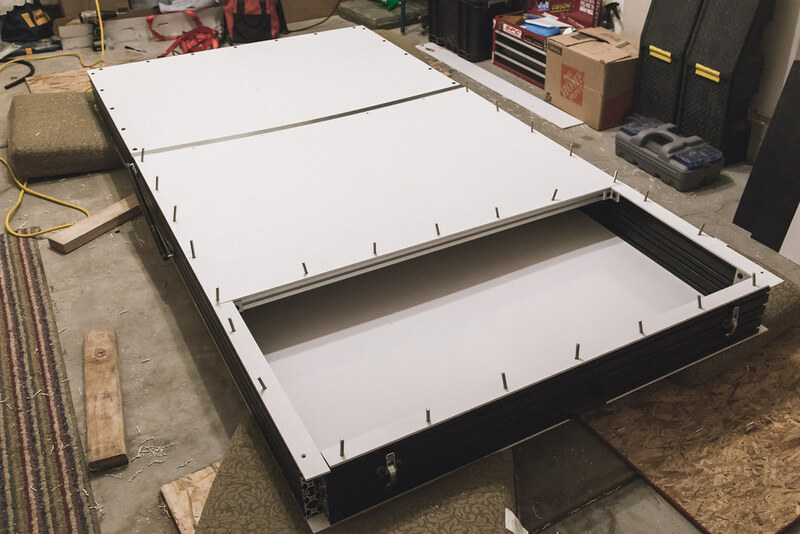 The latches at the back of the hatch took some planning to get everything to fit between the 2 latches, 2 gas strut mounts, and stiffeners. Used small pieces of felt where the latch clamps on to the frame to prevent scratching. 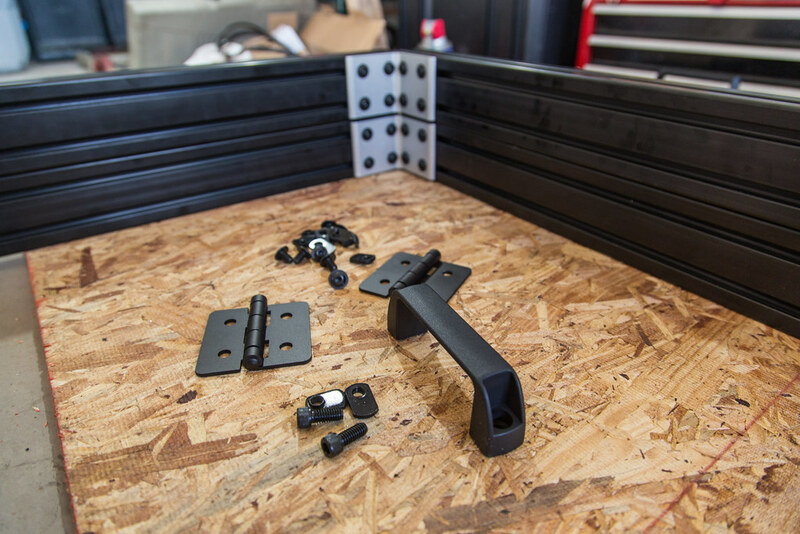 The latches for the rear hatch needed a space frame member to clamp on, so I turned them sideways. 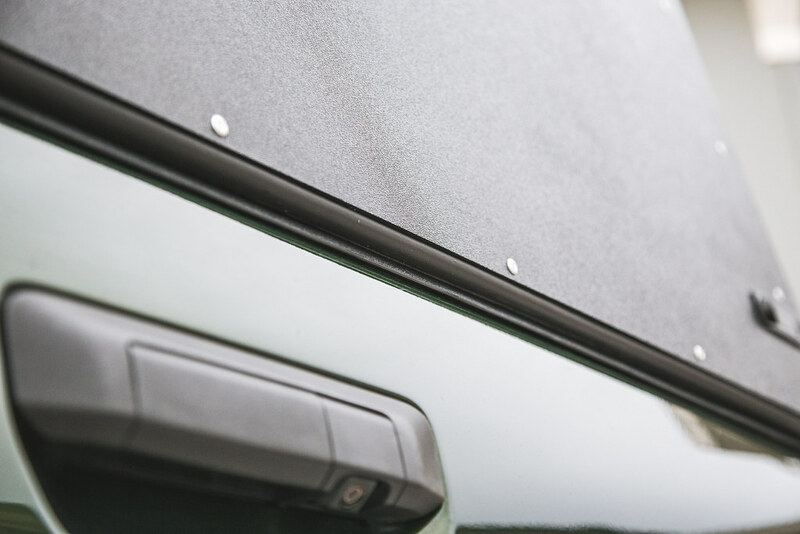 The panel on the right of the image is the rear hatch and the one on the left is the passenger side, for reference. Along the edges of all these door openings, I used a “single bulbed” seal. For the front bulkhead, I used ⅛” F7 Felt here instead of the bulbed seal since it’s a fixed interface and I can have bolt holes through the felt while still sealing around them. 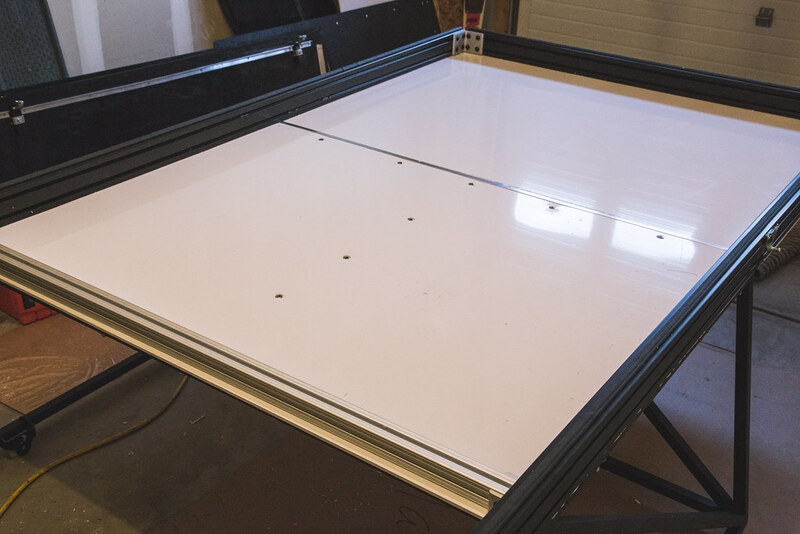 To mount the bulkhead, I just drilled through the plastic and the space frame (before paint) to attach it with countersunk #8-32 through bolts. 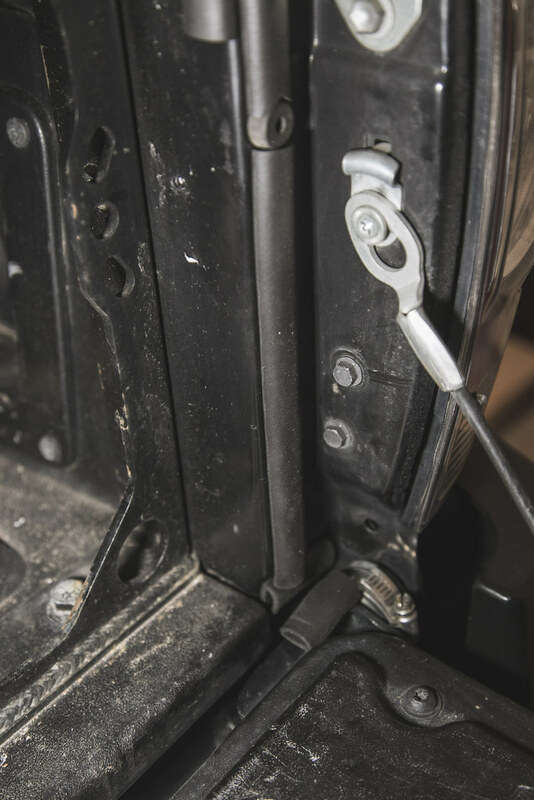 GFC uses Dzus fasteners here. WarrenG, AxisCab, synaps3 and 9 others like this. 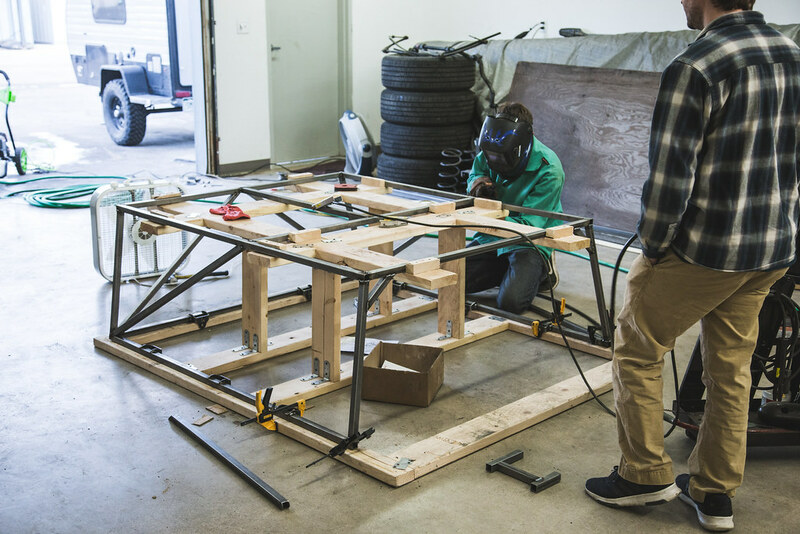 Now the project gets exciting, this is where we combine the wedge with the space frame and install on the truck! 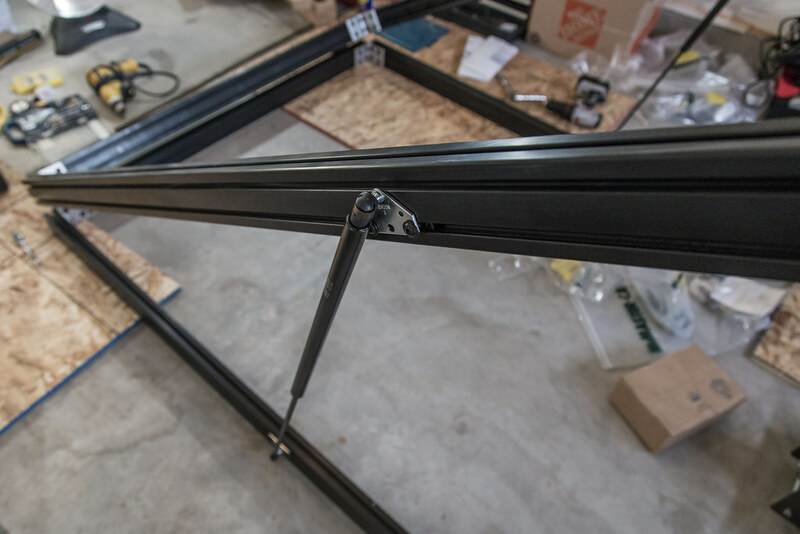 I used the carriage bolts shown in part 1, lined up positions for through holes, and drilled through the spaceframe (all before painting the frame). 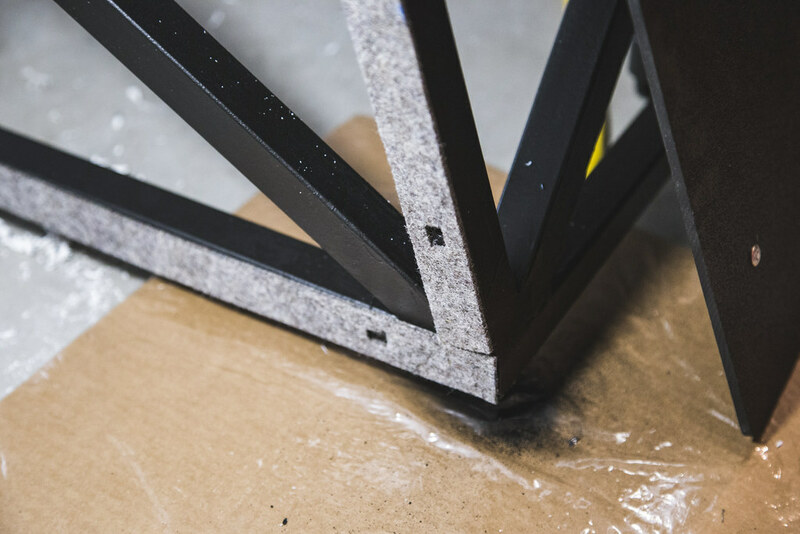 Again used Felt here to seal the fixed interface between the space frame and the wedge. Roof is off in this picture, made it easier. I also did some countersunk bolts through the floor in the middle section going through the space frame. This is the extra floor support I was talking about in part 1. And I got some rubber thread covers for when I inevitably hit them with my head. 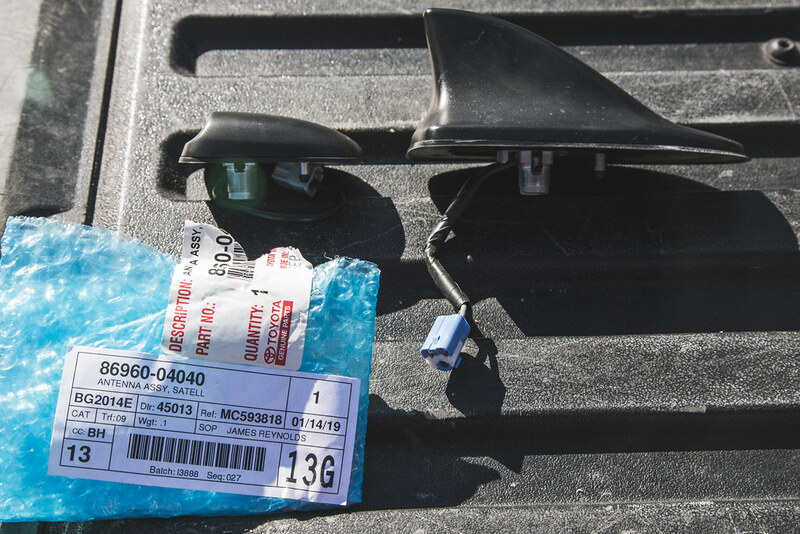 To prep the truck for the camper, I had to do something about the shark fin antenna for the Satellite Radio. The fin part itself is useless actually and contains no antenna parts, only plastic. So I got the Low Profile version of the antenna from the earlier tacos (86960-04040). Must remove the headliner to do this change. *No seal between them and the bedsides, creating another path for dust. *Moves around and can scuff the paint. *Adds about ¾” to the bed rail height. 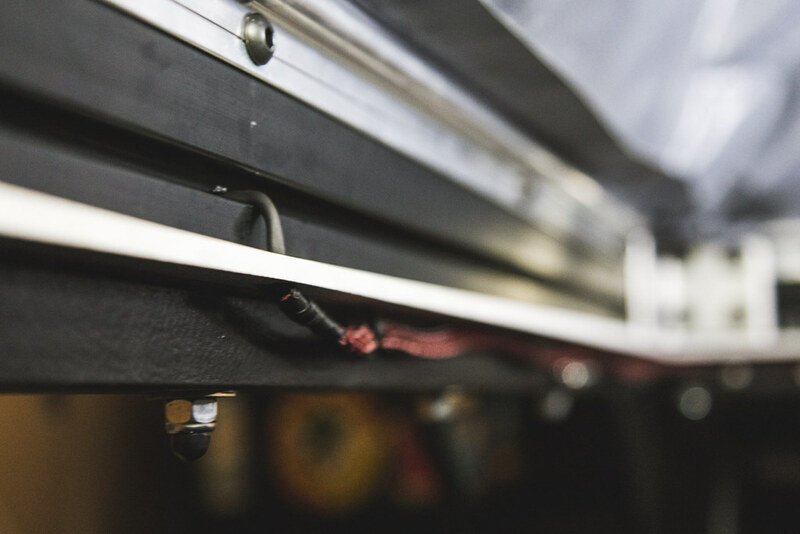 At this interface, I used some window flashing butyl tape to seal the holes on the bed rail (thanks Jim Bob for the tip) and a “double bulbed” seal for the spaceframe to bed rail interface, bed rail at the front (behind the cab) got a single bulbed seal. 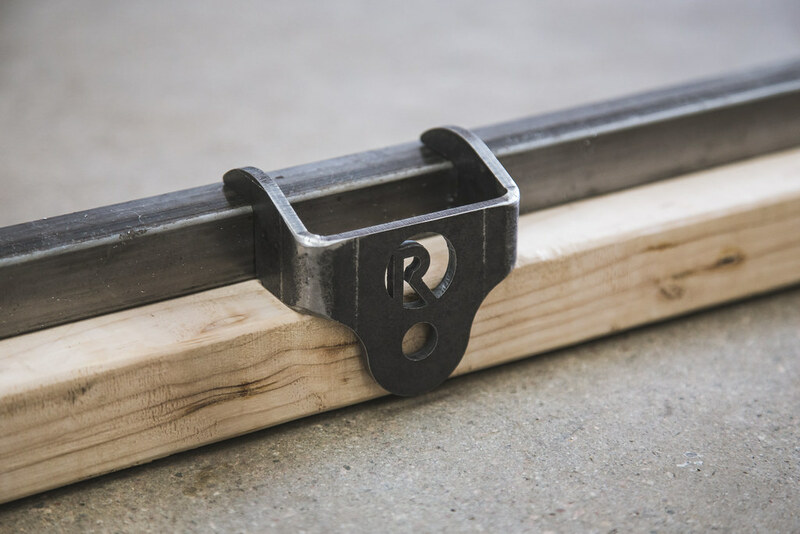 With the design of the OE bed sides, you want the weight to be primarily towards the inside of the rail as shown here. There is much less strength towards the outside. Called in some reinforcements to help install the camper. My BroCo Adventure Media friends all answered. 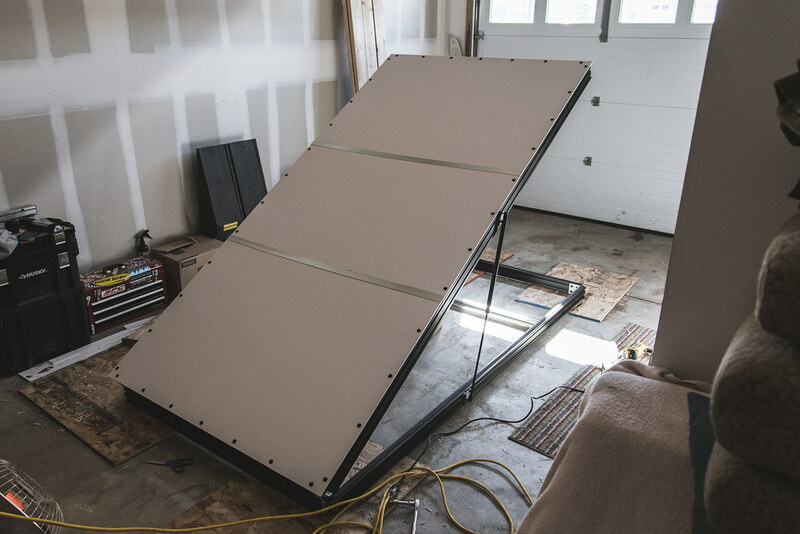 I took off the roof and the side doors of the camper to reduce weight for install. 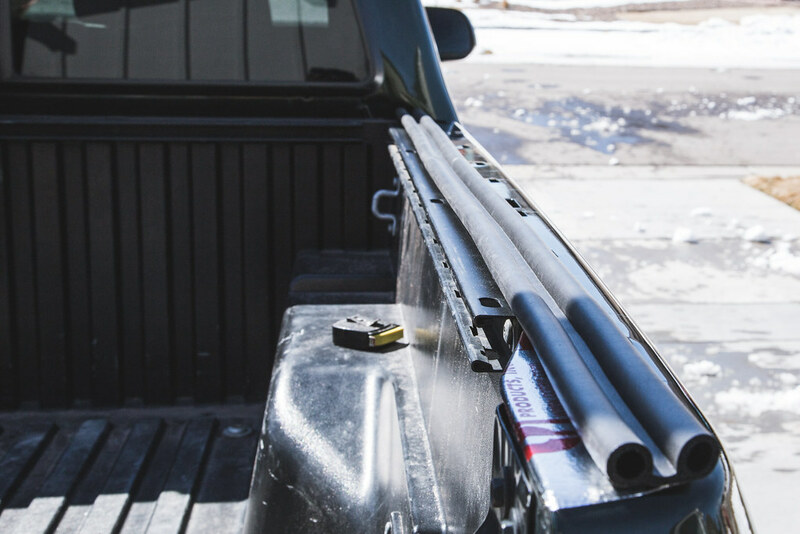 The stock bed rail tracks are what I am using to fasten the camper to the truck bed, 3 per side and 2 on the front. With some ⅜” T-slot track nuts from McMaster-Carr. Now that the camper is on, time to wire the brake light. I got this $12 light from Amazon. To power this, I just removed the driver side tail light assembly and probed the pins to see which one jumped to 12V when the brake pedal was pressed, then spliced into that wire and the ground wire. 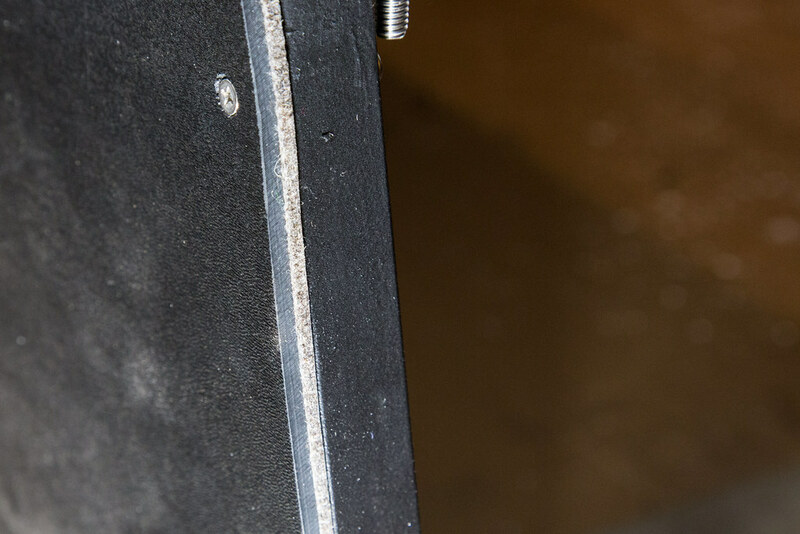 I drilled a small hole through the extrusion for the wires to pass through then sealed that hole. 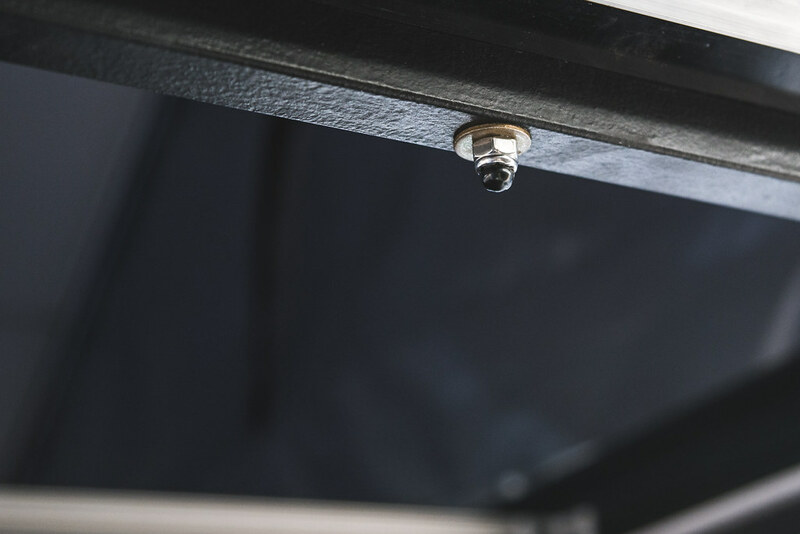 Mounted with the same 5/16”-18 slot nuts and some socket cap screws. I added another bulbed seal here at the bottom of the hatch where it meets the tailgate. This seal I put on the bottom of the stiffener, so it would face the right direction down towards the tailgate. 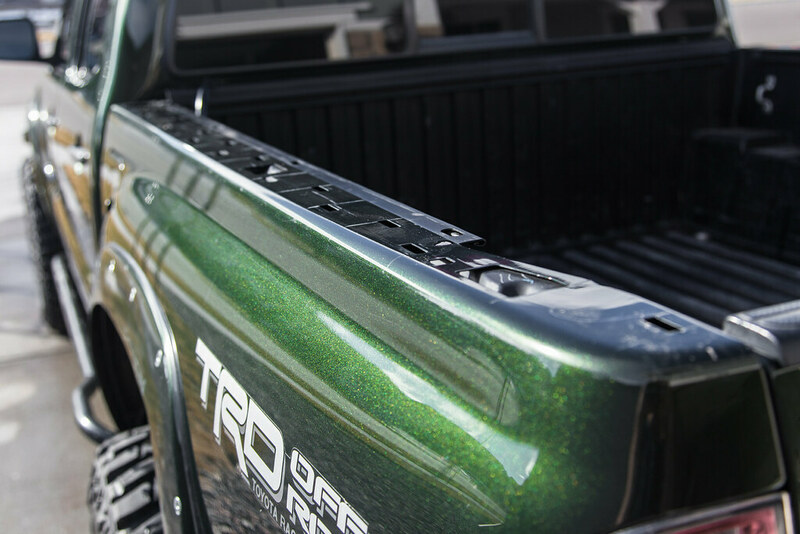 And lastly some more bulbed seal around the edges of the tailgate. I also used some trim fasteners to plug the holes in the bed & cubbies, but didn’t take a pic of those. synaps3, DaveInDenver, ScenicCityOverland and 10 others like this. Final weight came in at 350 lbs. Mostly thanks to the heavier-than-expected plastic and mattress. Was shooting for 310 lbs. A quick opening video to show how fast this thing can be. People with traditional RTTs will understand how amazing this is! 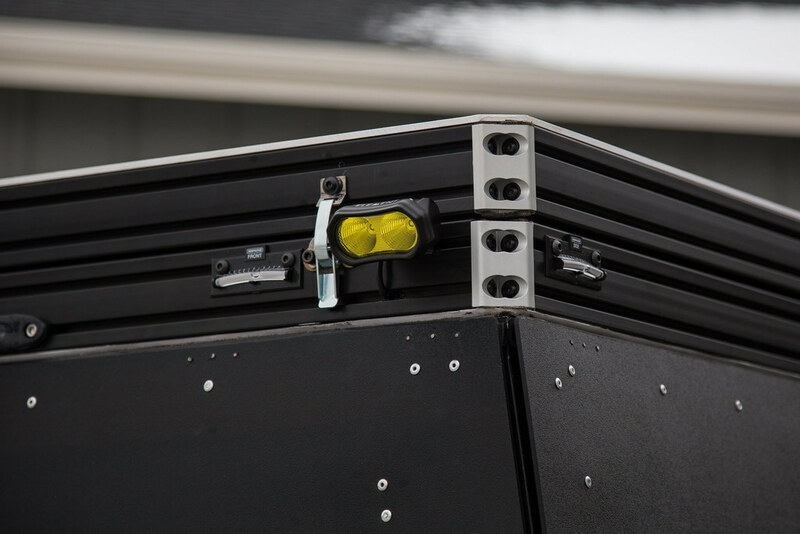 ElementLED MicroPod lights, with yellow film. Used the same wiring harness from my previous dust lights. For routing the wires, I followed the same procedure as the brake light above. Also some $8 hopkins level gauges, pretty common trick for campers and trailers. All mounted with the same slot nuts. I picked up this 16” collapsable stool from Amazon for $22. Makes getting in much easier. 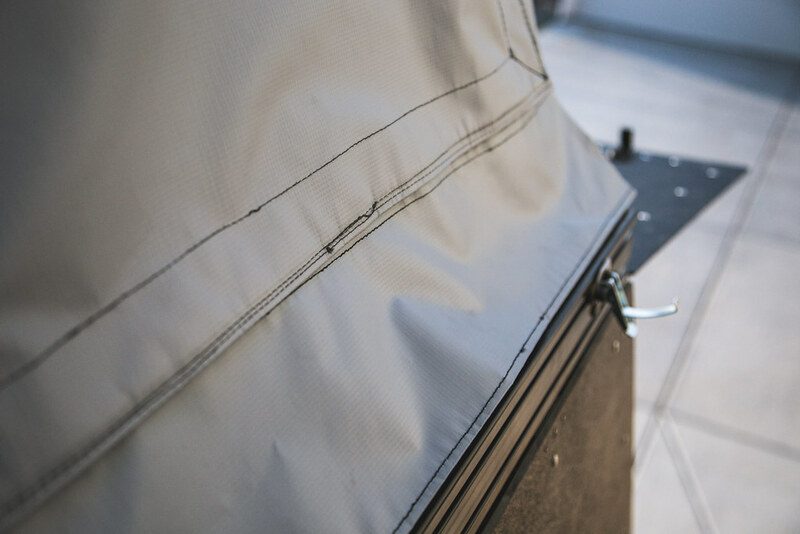 The tent fabric also has a small skirt going around the bottom to aid in rain water drainage. Still BARELY fits in the garage! 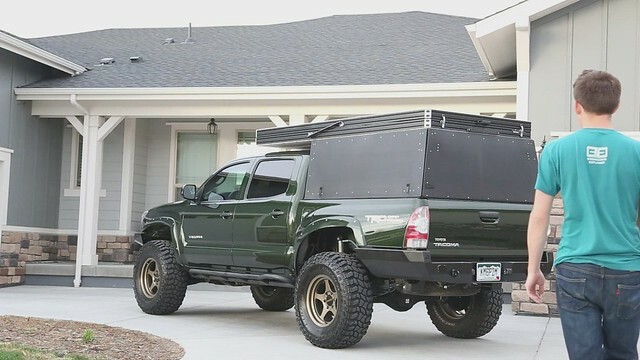 I have a standard 7 foot garage door for reference, and i’m on 35s. WarrenG, mountainmonkey, synaps3 and 18 others like this. 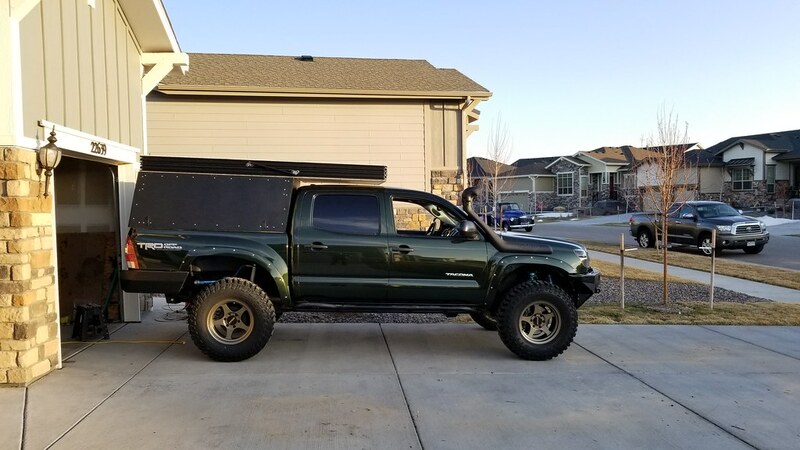 Since this was my winter project, its first trip would be cold. This trip was just camping, no wheeling. Went with a local friend, Mike, that runs a YouTube Channel: Last Line Of Defense and his friend Brad. 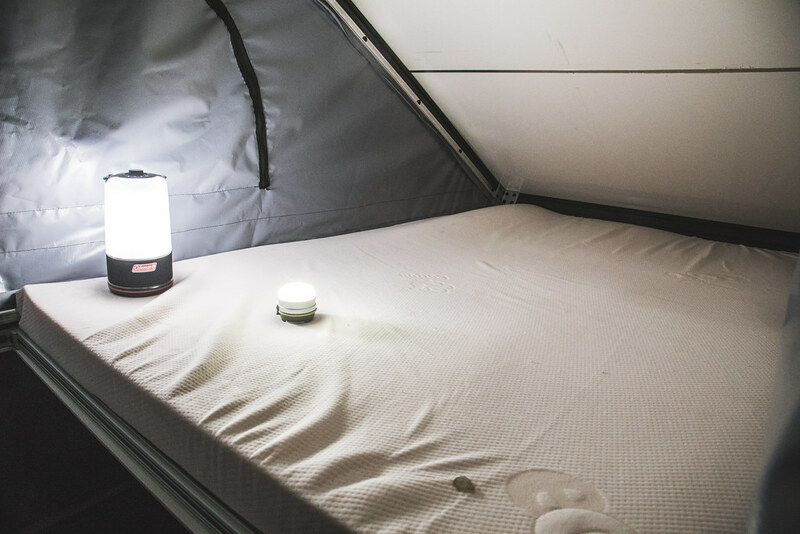 It is incredible how liberating it is to be able to set up instantly without having to fumble around setting up a tent, especially in the dark. I can see it changing how I plan trips. Not to mention the ability to pack up and leave just as easily. During this trip I noted a few things that should be addressed. First, the rest of the exposed holes on the bed rail are still allowing mud to fly up through them (thanks to my lack of a wheel well liner). But none of this is getting inside the camper since I only left holes exposed on the outside. And the second is that I definitely need a wind deflector of some kind. 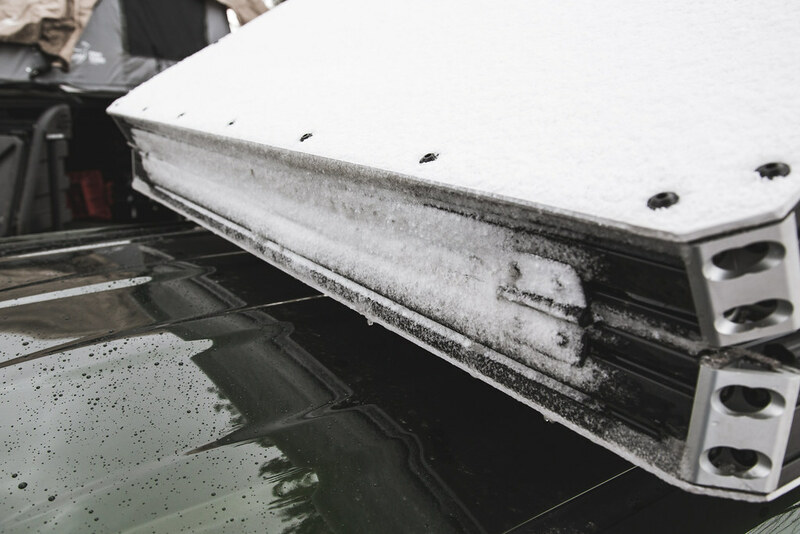 Drove through some snow and it accumulated some on the front. Also would help with the MPGs. That’s all for now! I hope you all find this thread to be useful. synaps3, rlx02, ScenicCityOverland and 18 others like this. 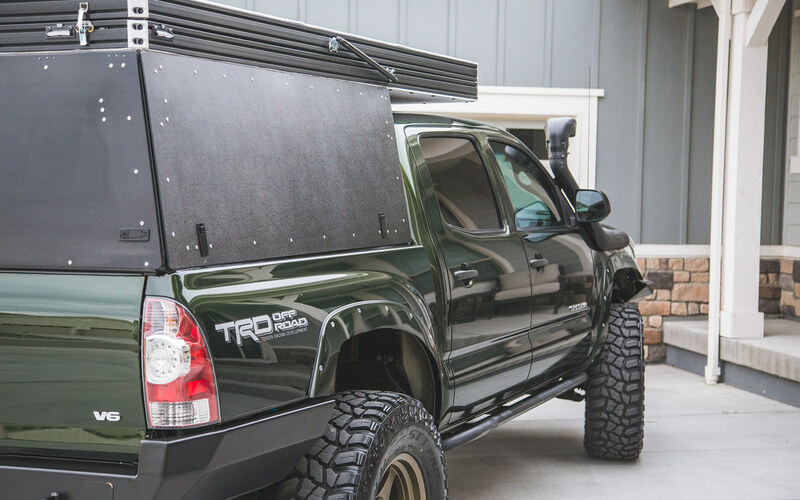 Modify the tailgate to open from the inside. Some lighting and outlets in the back. 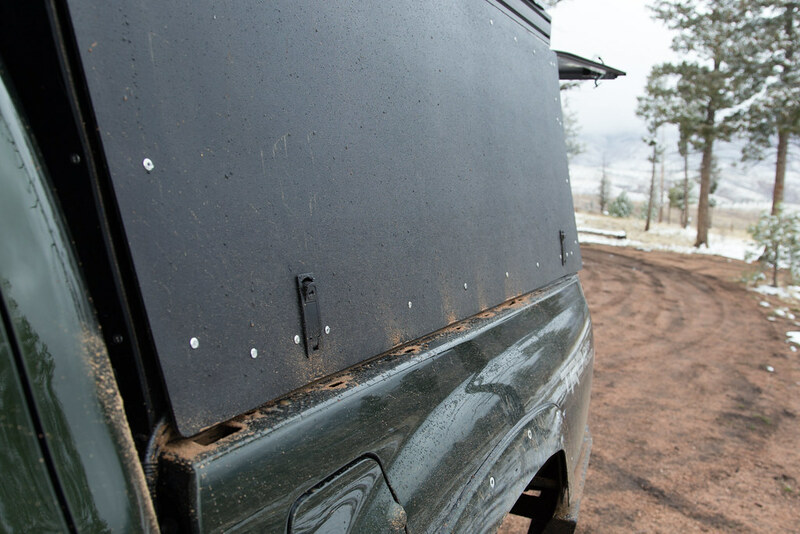 Change the wavy inner tailgate panel for a flat one. Deep cycle battery with solar charging. ScenicCityOverland, 3rdturd, Earfarmer and 2 others like this. Beretta4x4 and Ripcord [OP] like this. Ripcord [OP] and ChadsPride like this. Awesome write up, super detailed! Also the camper itself is amazing, definitely makes everything a bit easier. Amazing work and congrats on getting it finished. Looks dang good. This is awesome! I’ve been wondering how’s hard it would be to do this on your own. I know I’ve seen people on here build their own trailers so it was bound to happen. 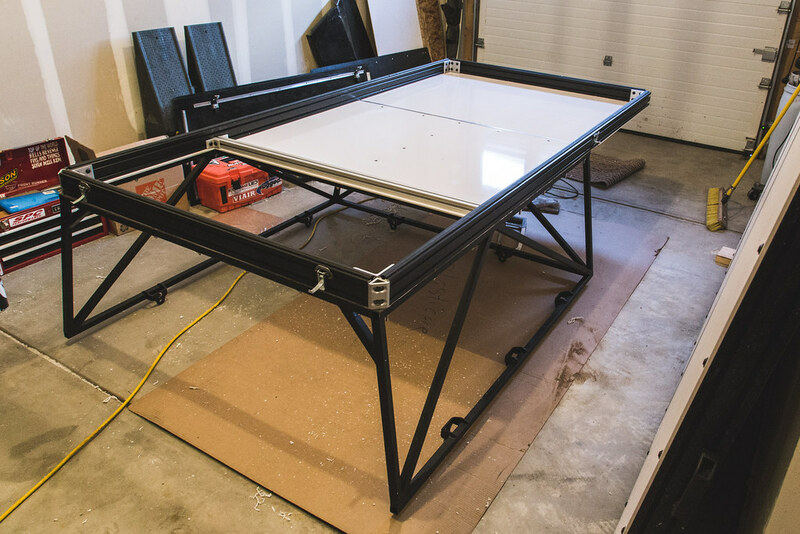 Do you think it would be possible to use the extruded aluminum for the frame instead of steel? Makes it a little more accessible for people that don’t have a welder, although probably a bit more expensive. During this trip I noted a few things that should be addressed. First, the rest of the exposed holes on the bed rail are still allowing mud to fly up through them (thanks to my lack of a wheel well liner). 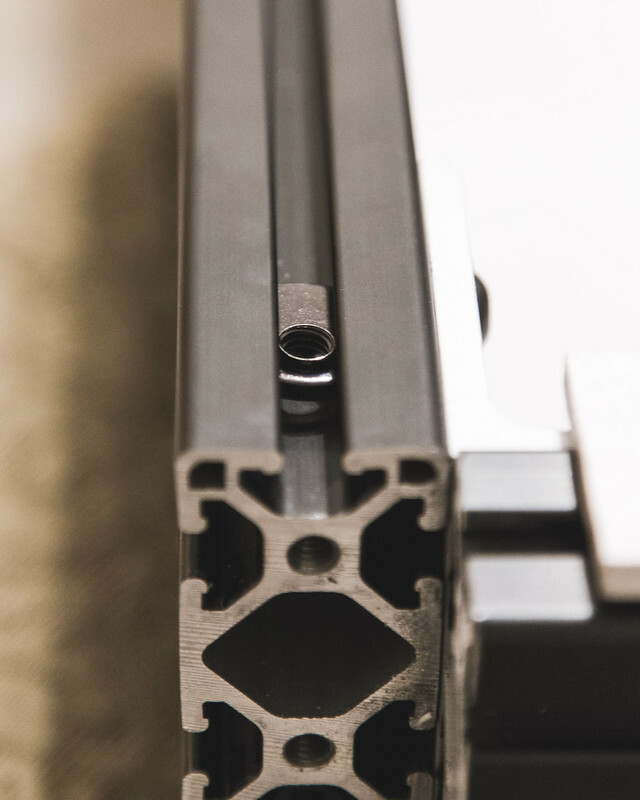 How do you think that thin wall square tubing will hold up in comparison to the DOM round tubing GFC uses? Looks great man enjoy it! Thanks for all the help dude! due to the angles that the tubes are at in relation to eachother, I would say no. 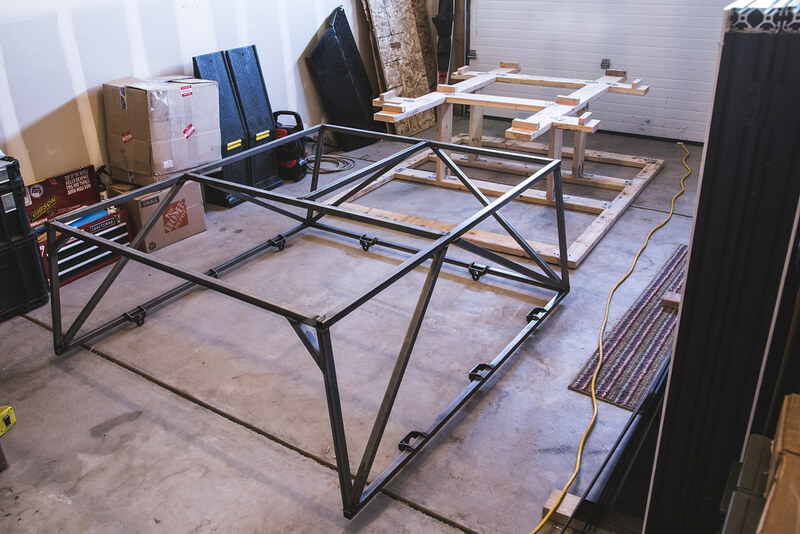 If you made a completely rectangular spaceframe then yes but that would look ridiculous. Based on all the math I did, it will be more than enough. 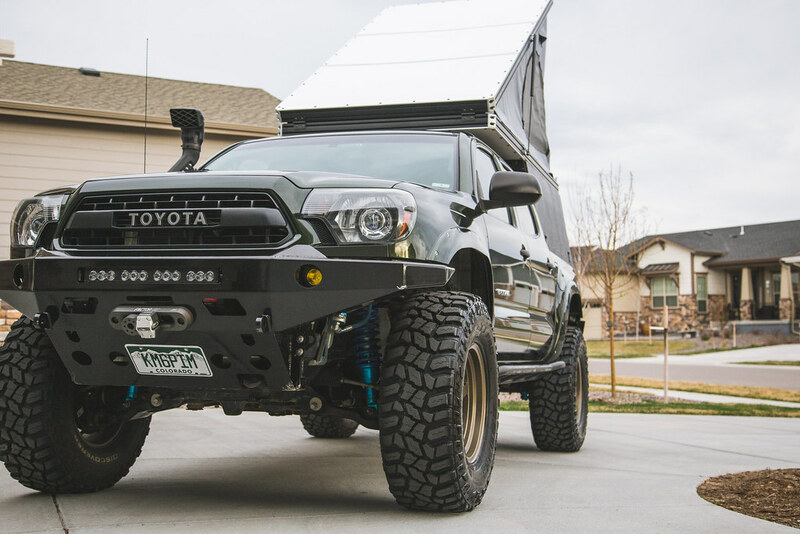 My theory is that GFC is marketing their camper as something you could damn near slap onto a trophy truck, so the round tube makes it look all racey. If I made another I might go with 1.5" with a slightly thicker wall, just for peace of mind. But i'm really not that worried about it. Thanks for following along the journey! Earfarmer, Squeaky Penguin and 113tac like this. Good job dud, it looks great! Wish I could see it in person. 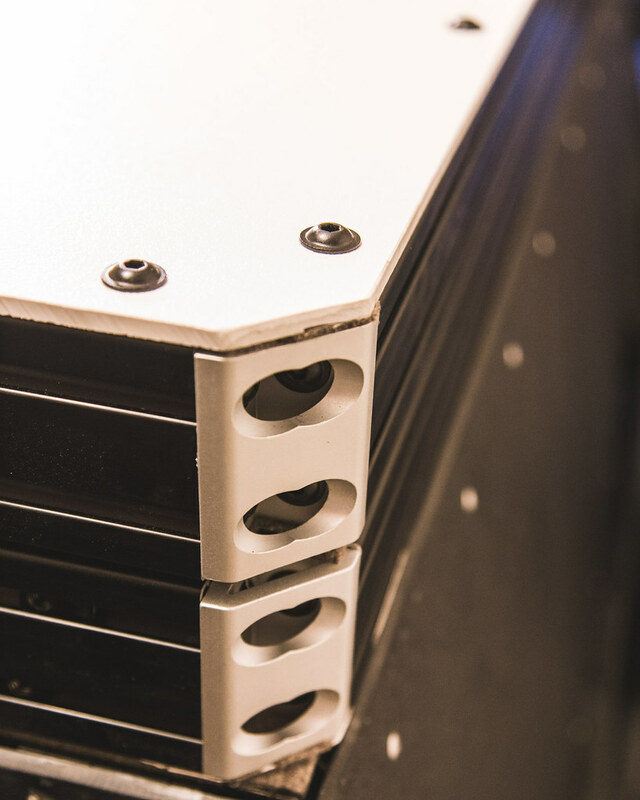 I do have a question though, what made you decide to use the ABS plastic for the side panels in lieu of something like Alupanel, which would give you the composite core with an aluminum finish? Because I have never heard of that haha. I'll keep that in mind if I ever make a V2, that looks much better than ABS. And thanks! Well I'm sure with your setup if you ever want to change them you could easily do it. 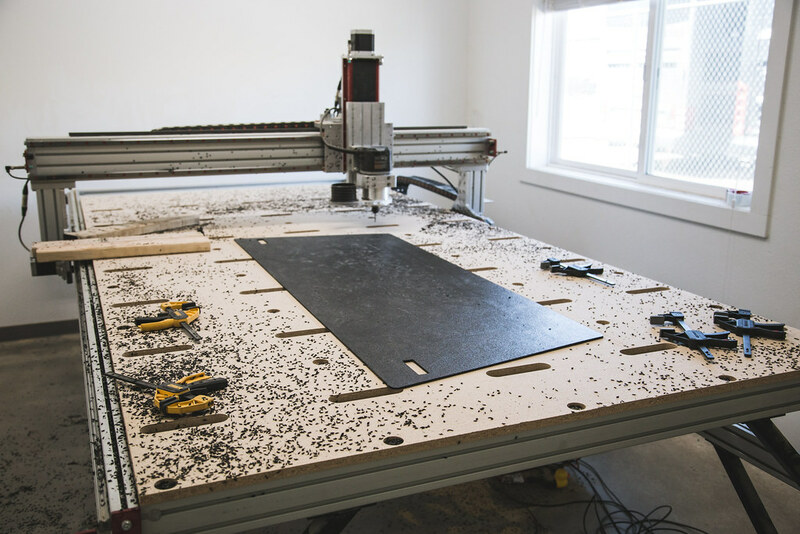 You can cut through it like butter using that CNC and your existing CAD file. It's pretty lightweight too if I recall. It's been a few years since I used it when I was working at some sign shops. Oh, and if you do, go through a signage distributer for it like Denco Sales. They have a shop in there in Denver. Yeah definitely, if it comes in large enough sheets could also do the roof with that. Pretty easy to swap out all the panels on this.